We met with Chesca, the Executive Director of Miraclefeet – a clubfoot non-profit based out of our very own North Carolina, and Janeen, her Director of Fundraising, last August to learn more about their organization and to tell them more about our project. It wasn’t long before we were discussing how our two initiatives could collaborate. Long story short: making this connection with Miraclefeet meant that Zach and I, thanks to their help, could finally add Latin America to our clubfoot adventure. By March, our tickets were booked to set off to Nicaragua in April. What happened next only demonstrates the perseverance and determination of both the Nicaraguan and American Miraclefeet staff. Just a couple of weeks before we were to head off, Nicaragua suffered a series of relatively strong earthquakes. 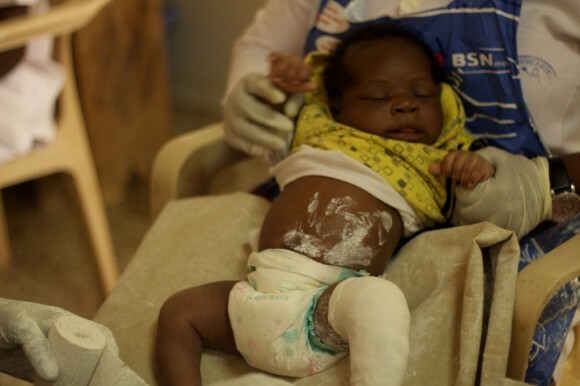 However, according to our talks with Miraclefeet, these earthquakes didn’t deter clubfoot treatment. In the midst of chaos, the in-country staff was so set on making sure patients were casted that there was even talk of moving the enormous clinics to a doctor’s home if the quakes continued and the hospital had to shut down. Because of the uncertainty of Nicaragua’s literal physical stability, our trip was postponed. It wasn’t until a few days before our departure that Zach and I realized that June 23-27 was our last chance to include Nicaragua in our project. 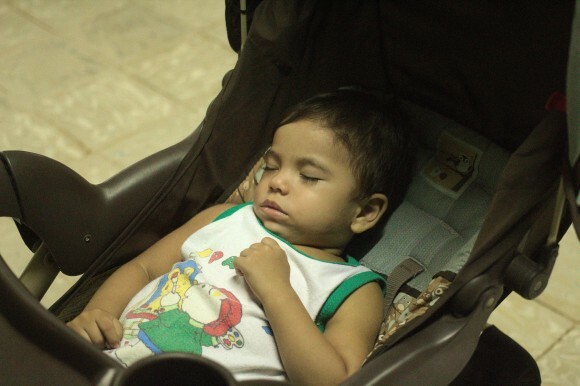 We set off with Leslie, Operations Manager at Miraclefeet, and flew to Managua. We arrived later Monday evening, dropped our bags at our Hotel, and then walked around the corner to a restaurant. Of course, this blog post wouldn’t be complete if we didn’t give you a glimpse into our meals. Zach, Leslie, and I shared three appetizers: fried ripe plantains stuffed with melted cheese, tostones – fried unripe plantain patties topped with baked cheese and refried beans, and nacatamales – an iconic Nicaraguan dish of rice and pork cooked in plantain leaves. It was truly a delicious meal. We headed back to the hotel and fell asleep pretty early. We had a big day ahead of us. Leslie, Zach, and I woke up bright and early Tuesday morning because Rebeca, Country Coordinator for the Nicaragua Clubfoot Program, picked us up at 6 a.m. to go to the main clinic. We arrived at the hospital before 7 a.m. It was amazing to see just how many mothers were waiting outside the clinic despite the early hour. Also waiting outside the clinic was Julio, our translator, and Katherine, the clubfoot clinic counselor. I’ll explain more about Katherine and her involvement with Miraclefeet in a moment. We walked through some very busy halls and entered a small office. Soon, we were greeted by Dr. Mario Sequeira Somoza and his colleague Dr. Julio Flores. Dr. Mario is one of the world’s leading Ponseti providers, and travels all over the world to help train other physicians. Dressed in a Winnie-the-Pooh smock and casting a complex case without any assisting technicians, Dr. Mario explained to us that his own son was born with clubfoot and received a multitude of surgeries. Clearly, clubfoot is a condition very near and dear to Dr. Mario’s heart. He also told us how he is trying to push the limits of the Ponseti Method. Initially, the method was thought to only be effective in young toddlers and newborns, however in recent years, many doctors (in many countries) have reported treating older children and even teenagers. Dr. Mario’s oldest patient is a 30 year old woman named Nubia who, according to Dr. Mario, is the oldest Ponseti patient in history. 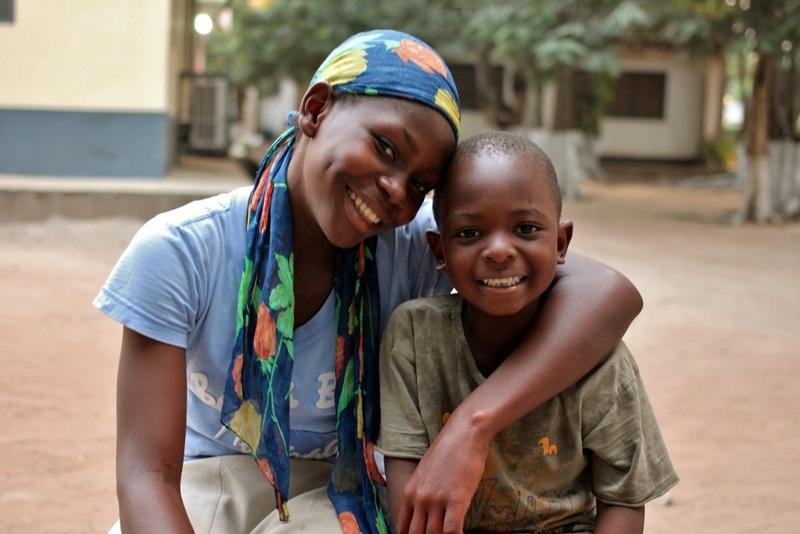 Nubia walked into the clinic with a smile on her face and a cast on her leg. Because she is an adult, and stopped growing years ago, she has received about 20 casts so far – returning to the clinic weekly since last December. Dr. Mario and Rebeca showed us photos and videos of Nubia’s foot prior to her first cast. 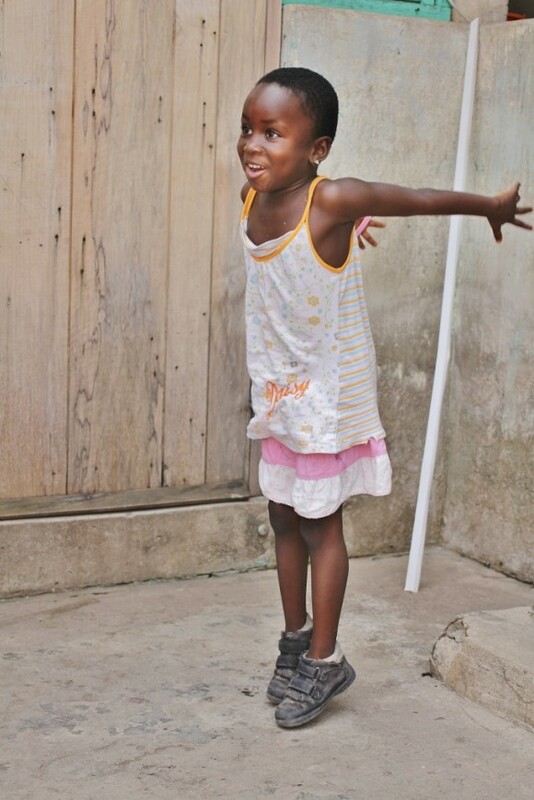 She walked on the top of her foot, just as Georgina in Ghana did. When her cast was removed, we saw that the bottom of her foot was now facing the floor. Still, even after this many casts, Dr. Mario explained to us that she was probably going to need surgery to completely correct the position of her foot. Zach and I were very curious about Nubia’s clubfoot journey. Although Rebeca had scheduled several interviews in the afternoon, we wanted to make sure we got a chance to talk to Nubia on camera. Leslie, Julio, Zach, and I left the clinic a couple hours early, jumped in the bed of a pickup truck, and followed her back to her home. 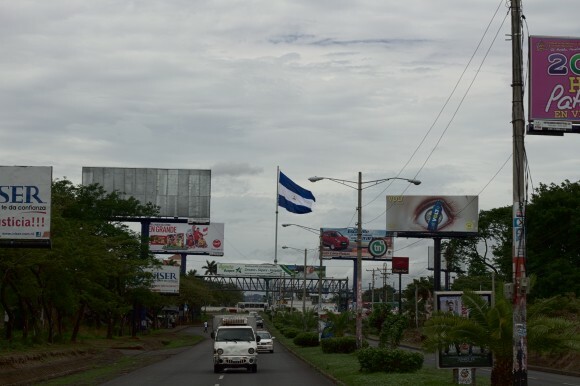 After about 40 minutes of driving, we arrived in a quiet little neighborhood in Ticuantepe – a small town just outside of Managua. 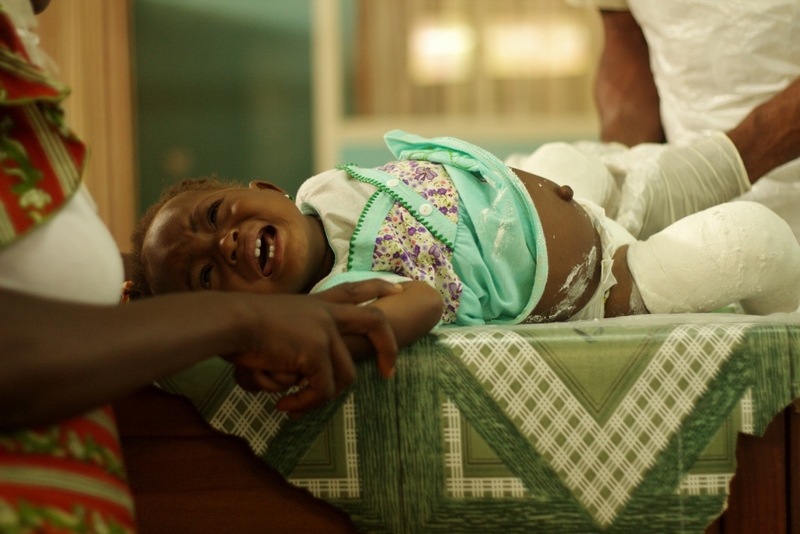 During the interview, Nubia maintained her strong composure as she explained the emotional pain her clubfoot has caused. She felt marginalized simply because of her inability to wear sandals – a small part of life that might never seem like a luxury to most people. 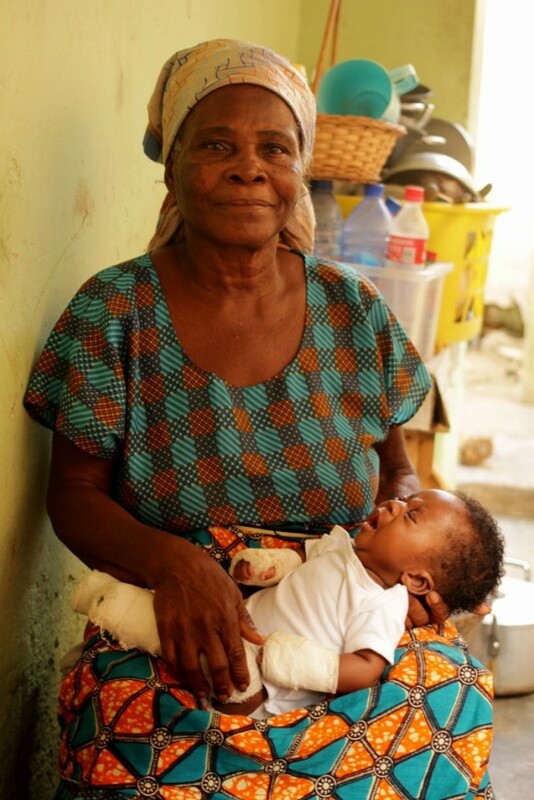 Nubia explained the pressure she felt having to financially support her family (which includes three of her own children) with limited employment options due to her clubfoot. Nubia started treatment three times, but had to discontinue them twice because the cost of transportation to the hospital was too high. Luckily, this time around, a friend, in whose truck we had just ridden, offered to sponsor her by driving her back and forth to the clinic weekly, which is why she has been able to continue treatment for such a long period of time. All four of us were taken aback by Nubia’s perseverance not only with her treatment, but in her strength to endure the emotional struggles which have burdened her for the last three decades. As the interview concluded, we saw Nubia’s face light up as her kids returned from school. We said our goodbyes, hopped back in the bed of the pickup truck and drove back to Managua. After taking a lunch break, where Zach enjoyed some empanadas and vigaron (cassava with fried pork rinds) and I devoured rice, beans, and plantains, we met up with Rebeca and Laura, a student intern from UNC working in Nicaragua for the summer. Rebeca drove us to Katherine’s house so we could finally hear her story. Katherine’s story is incredibly inspiring. Although she looks no older than 14, 23 year old Katherine is the mother of 20 month old Jean. When Jean was born with clubfoot, Katherine went to a few hospitals looking for treatment for her son, though at most places she was told that either her son would never walk or he would need extensive surgeries. Katherine wasn’t satisfied with those answers and decided to take matters into her own hands. She researched online, trying to find the best clubfoot doctors. After learning of the Ponseti Method, she personally emailed Dr. Morcuende in Iowa. Luckily, Dr. Morcuende knows Dr. Mario very well, and responded to Katherine, putting her in touch with him. 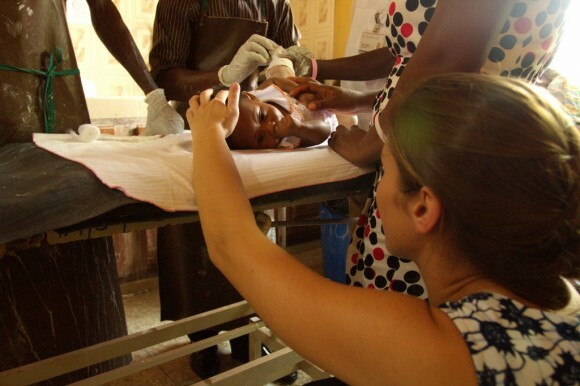 Since then, Katherine has showed such incredible leadership at the clubfoot clinic. She teaches other mothers how to put on the braces and gives them tips on different parts of the treatment process. Miraclefeet recognized this leadership potential in her, and has now officially added her to the team as a counselor for the other mothers. 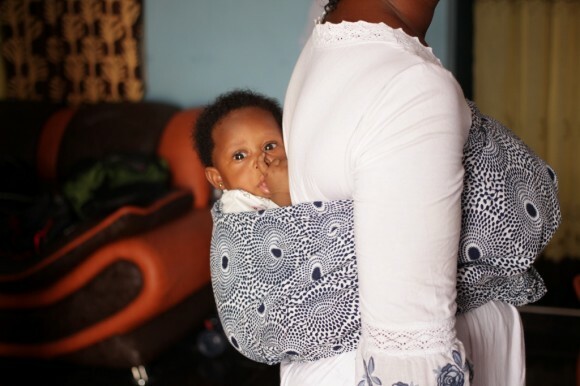 We saw how crucial the counselors were in Ghana, and thought it was great that Miraclefeet recruited a fellow mother to guide parents through the process. The importance of emotional support for the parents of patients has been a motif throughout our travels, so we were glad to see that such measures are in place in Nicaragua. 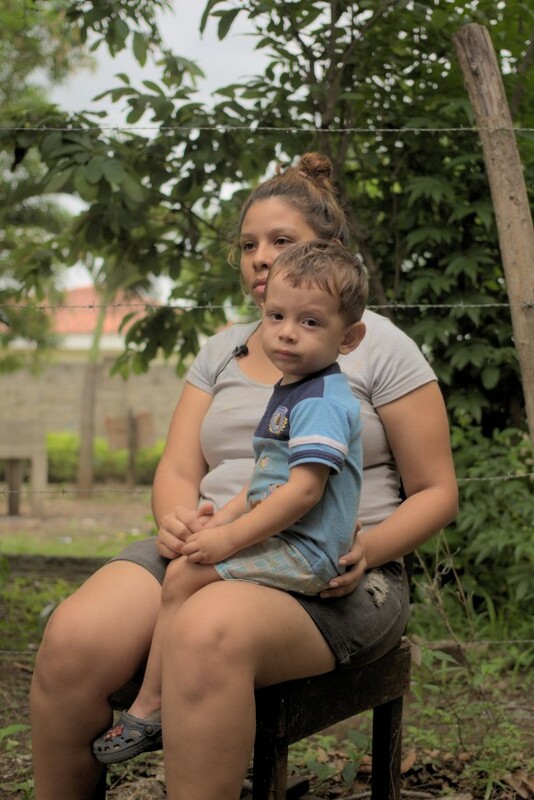 We concluded our interview with Katherine and headed to the home of another clubfoot family for a shorter interview since Julio needed to head back and it was late in the afternoon. 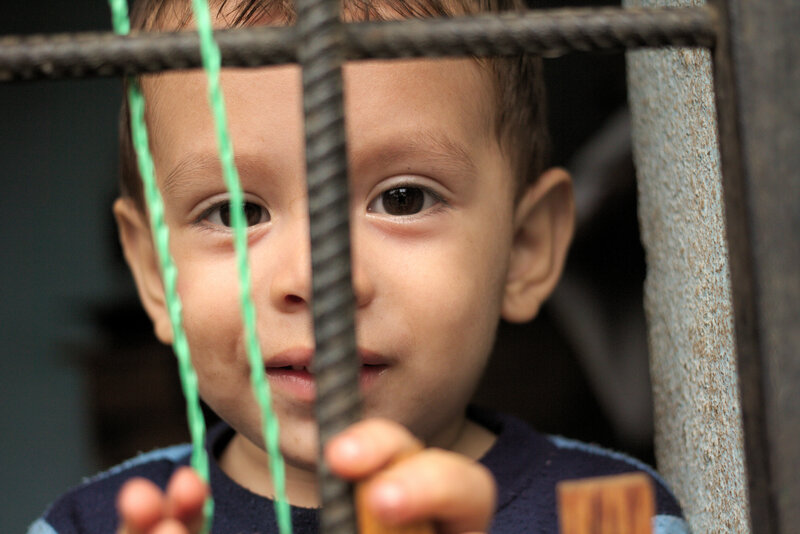 While Zach interviewed the mother, Silvia, I played peek-a-boo with her 2 year old son. Rebeca and I tried to keep him entertained as Silvia told Zach why she though clubfoot awareness was important. She explained that if all mothers, even those without a child with clubfoot knew about it and knew where to get treatment, then they could help mothers of children with clubfoot searching for a solution. Essentially, there would be an entire network of educated mothers who would informally spread the knowledge between each other. As we finished the interview, I was able to get some good footage of her son running around (and riding on his miniature four-wheeler). After we said farewell to the family and to Julio, Rebeca and Laura dropped me, Leslie, and Zach off at our hotel. The three of us grabbed an early dinner and went to bed. Rebeca was going to be back to pick us up at the hotel bright and early again in the morning. 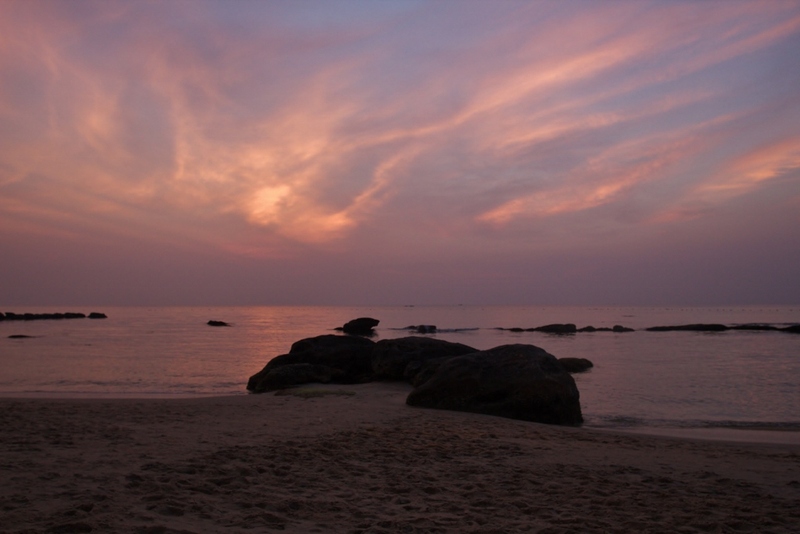 Our final week in Ghana (and the final week of our entire three-month-long journey) started off with a treacherous journey from Dodowa to Busua Beach. On Friday, January 31, Zach, Oti, and I left the guesthouse in Dodowa around noon. It had just begun to rain as we packed our bags into the taxi. As we drove towards Accra, the rain came down harder, and harder. Since it is currently the dry season in Ghana (which you wouldn’t think it was, judging by this torrential downpour), the ground was too hard to actually soak up the water, causing it to wash out unpaved roads and pool in the crevices. Our taxi driver reluctantly drove through flooded streets, risking his own dry clothes to go out and measure how deep the water was before passing through. Ultimately, in the battle between the taxi and the rain, the rain won. I felt a sudden cold wet sensation on my feet, and looked down to see that water was rapidly pouring into the bottom of the car. The driver had had enough and decided to stop for a while until the rain subsided (and the water could recede from the interior of the taxi). All of us hopped back in the car once our driver thought we were in the clear and could finally make some progress. It was well after 2:00 PM and we’d travelled a whopping 20 km (about 12 miles). After getting stuck in a deep, newly formed pothole (leaving Zach and Oti to push the car free), we arrived in Madina, a suburb of Accra which has a bustling market, a large tro tro station, and many ATMs. We needed to withdraw money for the upcoming week, however, and little did we know that it was payday for many Ghanaians. Everyone was withdrawing their cash. Zach and I went from ATM to ATM trying to find one which hadn’t yet run out of money. After almost an hour of searching, we finally were able to complete one transaction, which could hold us over for the next couple of days. But our journey didn’t end there; our attempt to get of Accra before rush hour had failed. For as much as I love Ghana, I equally despise Accra between the hours of 4 and 6 PM. My appreciation for traffic engineers back at home is always greatest when I am forced to experience traffic in Accra. When you combine the normal chaos of Accra with flash floods, well let’s just say it equals a 3.5 hour journey to travel only 20 km (12.5 miles) to Kaneshie Market. At Kaneshie we got a direct tro tro to Takoradi, a large coastal city in the Western Region in Ghana. We arrived in Takoradi at about 11:30 PM, and took a Taxi to Busua Beach, finally arriving there around midnight. In total, it took about 12 hours to travel about 200 miles. Now you might be saying to yourself, “Okay, Hannah, we get the picture. It was miserable, it was long. Was it really necessary to go into all of this detail?” Yes, it was. Not because Zach, and I are martyrs, and not to show you our ‘struggle’ to get to a nice beach where we spent the weekend. 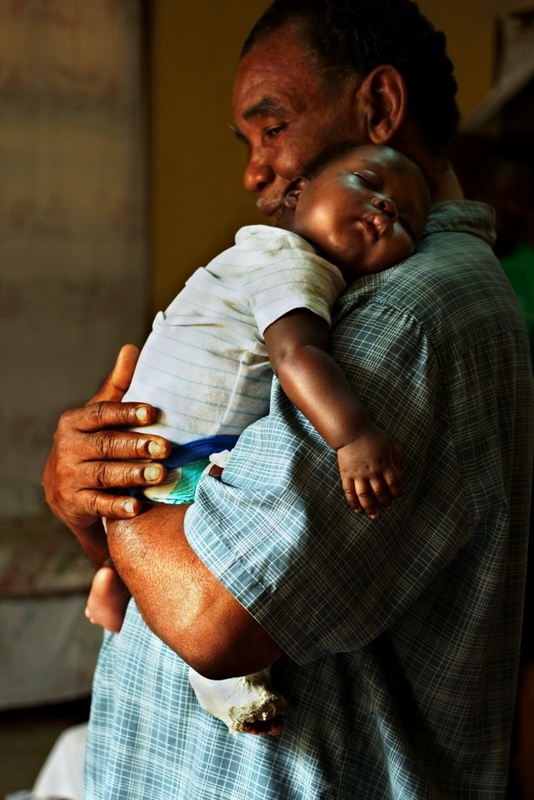 I mention this exhausting journey because Jerry and Joseph travel along such routes several days a week to keep the Ghana Clubfoot Program running. 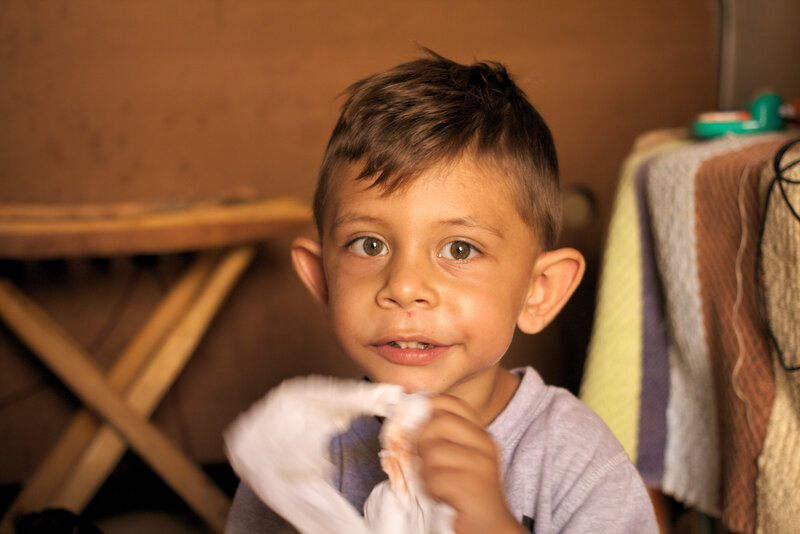 Joseph will spend long hours in a tro-tro just to make sure he can get to a clinic to perform a tenotomy, and Jerry will travel miles and miles to pick up braces and hand-deliver them to various clinics in need. They do all of this because they are so passionate about changing lives and reversing disability. 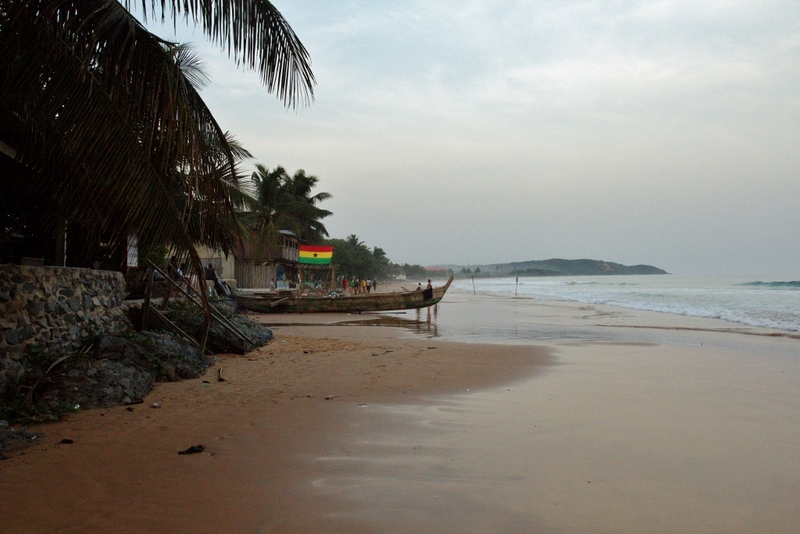 We spent the weekend at Busua Beach enjoying our time with Oti. 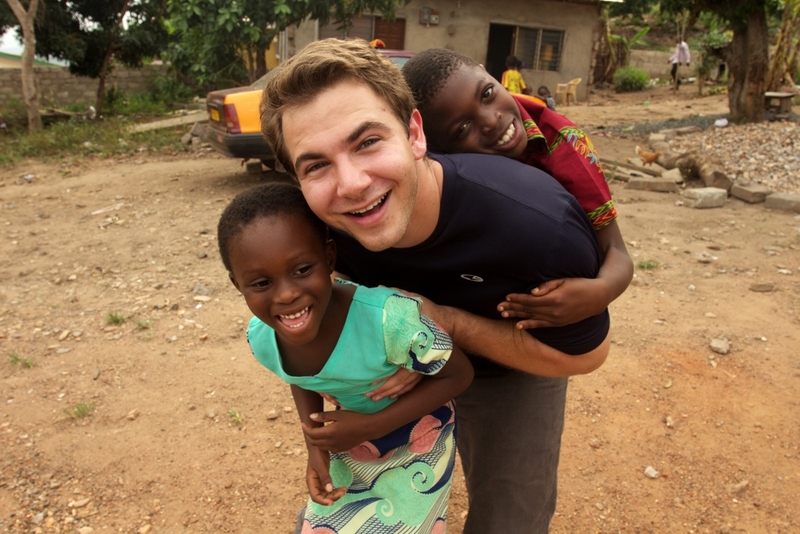 It was our last weekend in Ghana and we wanted to really make sure we didn’t miss a moment with our friend. 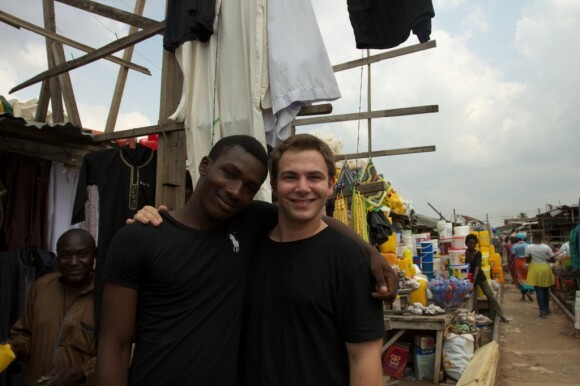 Oti and Zach had gotten very close over the past few weeks, and their friendship had really progressed. They had their own inside jokes and went on a couple of their own adventures. Seeing the two of them get along so well only made me happy. 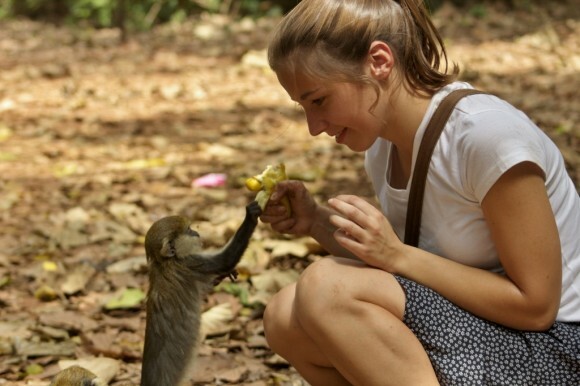 Besides, I had a little primate friend of my own at the inn we were staying at. We hadn’t seen each other in over a year, but she greeted me by jumping on my shoulder, and looking through my hair for bugs. I fed her bananas, and whenever she realized I was without the company of two males, would come sit next to me, hoping for a head scratch or a belly rub. Ultimately, I always gave in. After taking Oti for the ride of his life on a Jet ski, and teaching him how to swim (in that order), we had to say goodbye. He headed back so he could be at work on Monday, but it would just be a few days before we would see him again. 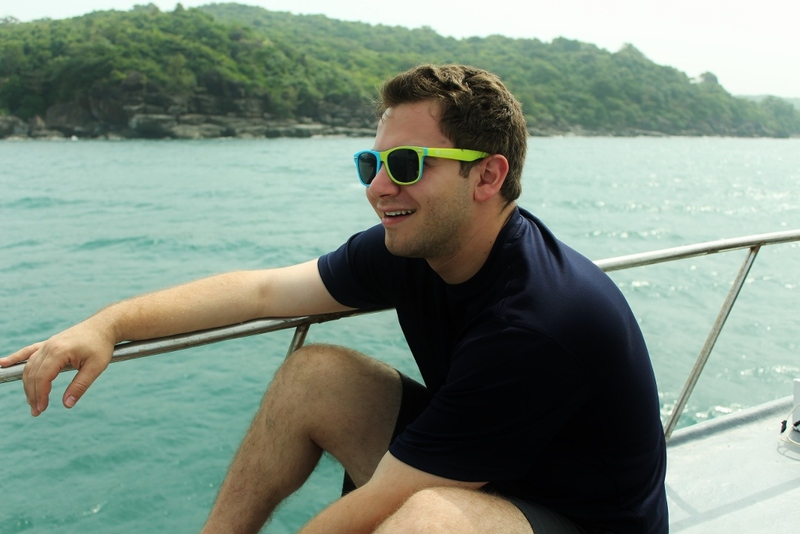 After he departed, Zach and I brought out our cameras to get some footage and photos of the beach. We heard some drumming coming from next door, so the two of us followed our curiosity around the corner, where there was a group of three men, each with their own percussion instrument. They introduced themselves as “Wonder Boy,” “Ecko,” and Akepoo. Their “manager” wanted to sit down and have a meeting with us about getting to the US to perform. Zach and I were flattered that they thought we were possibly this well-connected, but there was little we could do from our side in terms of live performance. 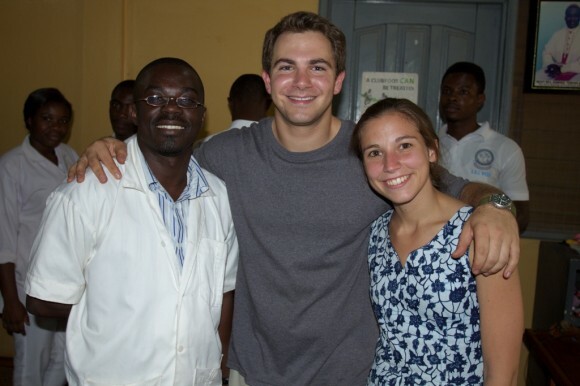 The next morning we headed to the Effia Nkwanta Hospital in Takoradi, where we met Jerry. 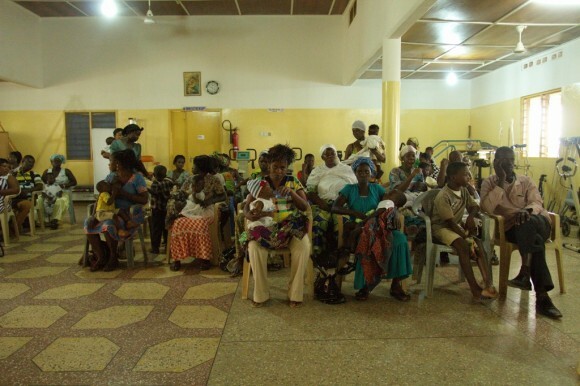 Effia Nkwanta has the largest and oldest clubfoot clinic in the whole southern part of Ghana. 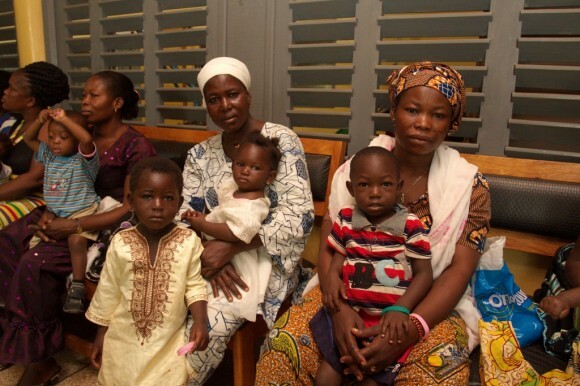 We filmed as mothers lined up with their children, awaiting their turn to see the clinicians. The clinicians explained that because of space (and staff) constraints, they are only able to see one child at a time. Judging by the amount of mothers who were still there when we left the clinic, such constraints really impact the efficiency of clinic. However, the few staff members available that were incredibly welcoming, and clearly very passionate about the work they are doing to help these children and their families. After enjoying lunch of omotuo and groundnut soup, Zach, Jerry, and I headed to Cape Coast, which is about halfway between Takoradi and Accra. It’s a very popular town among tourists because of its proximity to the beach and the Cape Coast Castle, a UNESCO World Heritage Site, and also a European fortress which housed some of the largest numbers of slaves before they were piled onto boats and shipped across the Atlantic Ocean. Although we didn’t get a chance to visit the castle this time, I’d been on the tour before. It was an intense experience that I won’t forget. 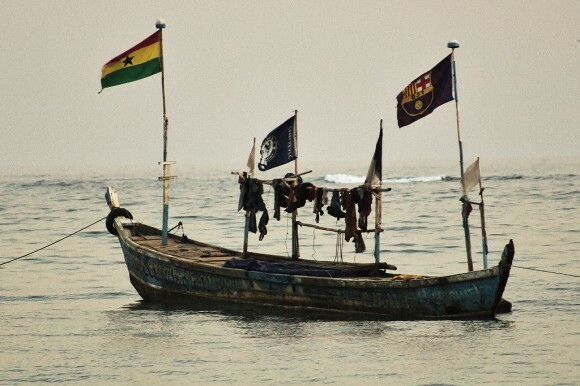 But this time, our trip to Cape Coast was about life. On Tuesday, Jerry, Joseph (who had now joined us), Zach, and I visited two patients. The first patient was a baby boy, Perry or as his family has nicknamed him, “Uncle Perry,” still in his casts. “Uncle Perry’s” real Uncle George welcomed into the house. George shared with us that he lived in Washington, DC for 10 years, which Zach and I immediately were excited to hear. After talking him for a few minutes about DC, and finding the best Ghanaian restaurant, we had to get on with the interview. Perry’s mother is young, and felt shy in front of the camera. I don’t think she knew what to do with so much attention on her, but eventually we were able to get some good answers from her about her experience with her child. Before we knew it, the loquacious Uncle George was back talking to us, and the interview concluded. We hopped in a taxi, saying our final goodbyes to Uncle George and Uncle Perry. Clearly, Perry is a very lucky little boy, constantly surrounded by an overwhelming amount of love and attention from his family. Our second patient was another baby, who had progressed to wearing his boots and bars. I reached over to hold this little guy while Zach set up for the interview. After a spending a few minutes of making him laugh by whipping my soft obruni hair across his face, it was interview time. Unfortunately (or fortunately) it was also nap time for Delivan. He immediately became whiny when Zach started asking his mother the first question. So I snatched Delivan up and took him around the corner. He settled down, sleepily gazing at every chicken and goat that walked by. By the time the interview finished, his eyes became heavy and he settled down on my chest for a snooze. 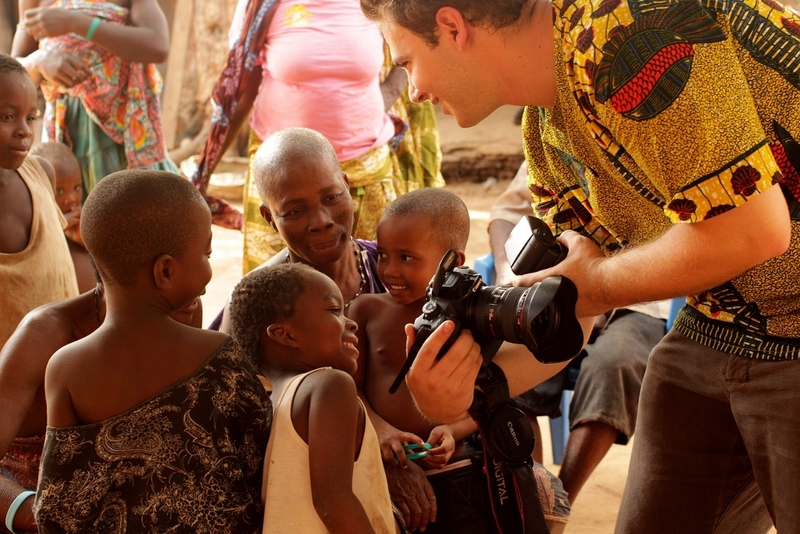 What a way to finish our patient interviews in Ghana. I didn’t want give him up, but it is amazing how much these little children can weigh when they are sleeping. I passed Delivan back to his mother, and we said our goodbyes to her. Jerry, Joseph, Zach, and I went and grabbed lunch at a nearby restaurant. After lunch, the owner graciously allowed us to use her secluded setting as an interview site for Joseph. It was our final afternoon with him and we had yet to record the details of how he became involved in clubfoot work for our film. Joseph is not a doctor, nurse, or physical therapist. He doesn’t have a degree to show for any of his medical training. However, he’s considered to be one of Ghana’s leading clubfoot experts, so much so, his role in the Ghana program is to ensure that the clinics are practicing Ponseti correctly. Joseph takes his job very seriously. 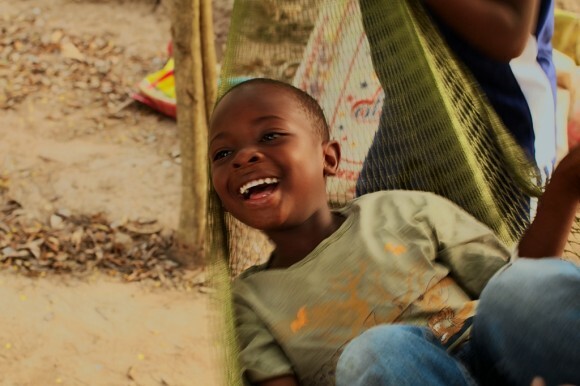 He’s completely saddened when he sees people with clubfoot on the streets begging, but overjoyed knowing how many children are able to get treatment, renewing their ability to walk and avoiding a life of poverty. I always knew that Joseph was dedicated, but hearing him talk about what motivates him and what is important to him made me realize how truly irreplaceable he is for the program. After finishing the interview, we said our final goodbyes to Joseph. That was when it really sank in that our journey was coming to a close. That afternoon we headed back to Adenta, a town near Dodowa where Oti and his good friend Mary (and a few other friends that work in Dodowa) live. Oti graciously offered to host us for our few final nights. We were excited to take him up on his offer. Oti and Mary spoiled us. They made sure we weren’t hungry, feeding us large breakfasts followed by large lunches just a few hours later, followed by large dinners. Zach and I made sure we made it back to the Charity for a few meals too. We cherished our final dinners with Emma, Elvis, and the rest of the children. On Thursday, Jerry came to Adenta so that we could finally interview him. I think Zach and I didn’t want the interview to end, because it also meant we would have to say farewell to our gentle friend. Jerry is a very humble man. Whenever we’d praise him for the work he is doing, he would always attribute his success to a higher power. On that last day, during those last few minutes with him, I really began to realize the scope of his work. 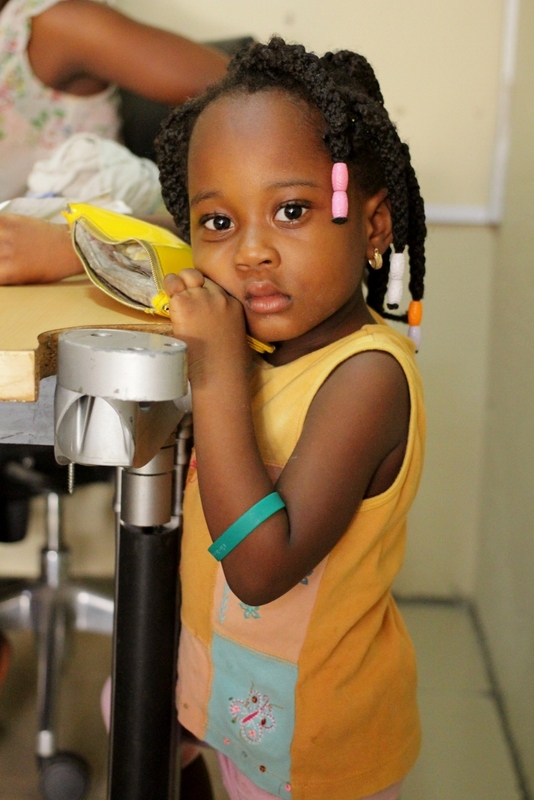 CURE International has clubfoot programs in many countries around the world. 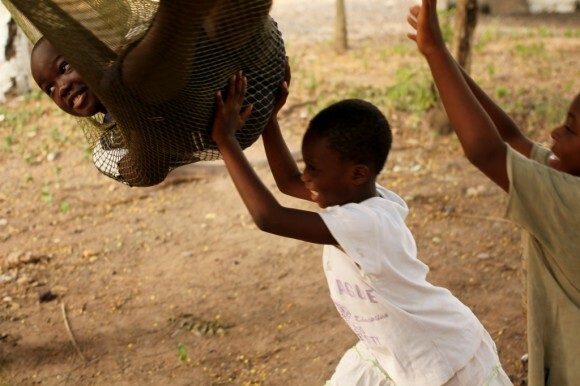 Their largest effort is in India, not surprisingly, treating almost 4,000 children annually. 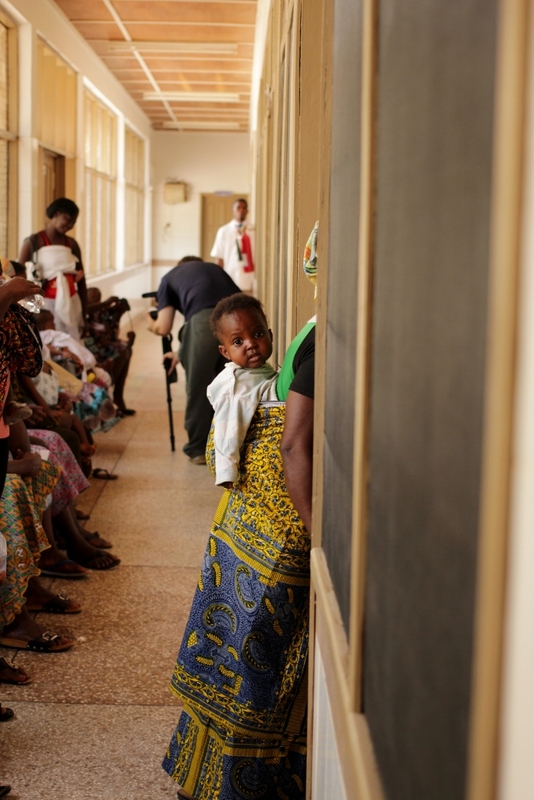 But in second place, in terms of the number of patients treated each year, is tiny Ghana, at about 1,300 children. This is amazing for a nation the size of Oregon. 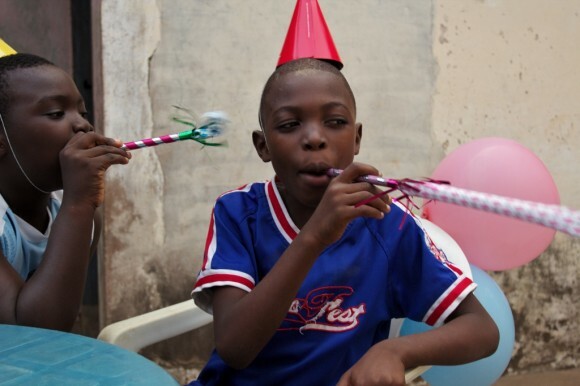 Jerry proudly told us about the quantity of children receiving treatment, further explaining that he hopes to achieve double by the end of 2014. 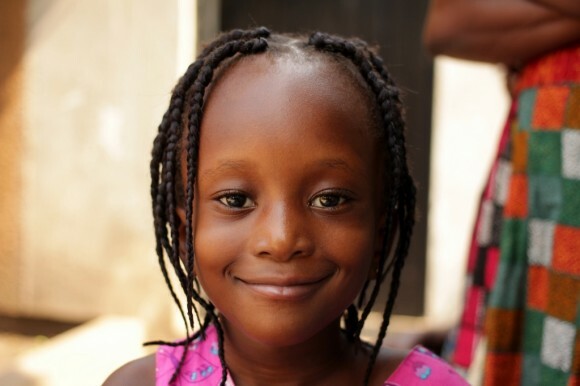 But not only does Ghana treat a great number of children, they retain the vast majority of their patients. Jerry said that counseling the families has really been key to making sure parents keep bringing their children back. 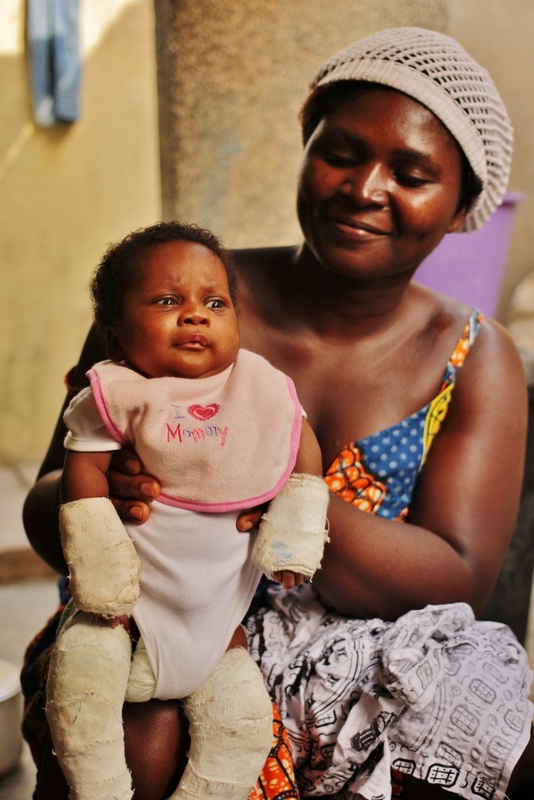 This does so much more than just make sure the clubfoot is corrected, it keeps families together, further affecting the future of these children and their ability to avoid poverty. But I think the point of the conversation which best illustrates the type of person Jerry is was when he started thanking us for the work we are doing. Zach and I were struck by the sincerity Jerry expressed his gratitude, explaining all that he’s personally gained by being our clubfoot guide in Ghana. We immediately told him that he shouldn’t be thanking us, that ultimately he’s the reason why so many children are getting treatment and why our trip had been so successful in the first place. Predictably gentle Jerry quickly took no credit, attributing it all to God. After the interview, Zach and I headed to Dodowa for our last night with the family. We enjoyed some delicious fish with banku, pepper, and shito (a spice sauce). After dinner we made the most of our final minutes with Emma, Elvis, Gina, Bernard, Quiaku, Kojo, and Najalie. Zach did some of his last rounds of shoulder rides, getting a good workout in before our 11 hour plane ride the next day. I couldn’t bring myself to let all of the children know that this was our last night. But Emma, being one of the eldest understood. He gave Zach and I big hugs, seeming to hold back a few tears. Elvis, as bouncy as ever, jumped up for me to hold him. I gave him a big hug, although he was unaware that this would be the last time we would all be together, at least until our next visit. 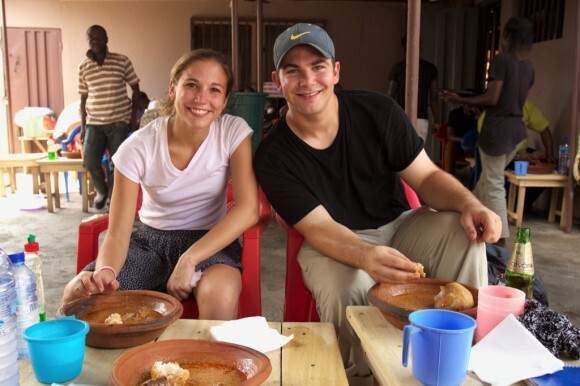 We headed back to Oti’s house to finish packing and, of course, enjoy lunch with him, Mary, and their friend, Francis. Before long, Oti had fetched us a taxi, and we all loaded our bags and jumped in to head off to the airport. At the airport, we took some (cell phone) pictures of the four of us together, exchanged hugs, and cringed as we had to say goodbye to our dear friends. Oti and Mary headed back to Adenta, as Zach and I made our way through immigration, and then to our departure gate. It felt strange saying goodbye to all of these people I am so close to, yet so far away from when I am at home. One might expect me to be sad, because maybe my chance of actually coming back a third time is slim. I, myself, thought it would be harder to say farewell to all of my Ghana friends and family a second time than it was last year. However, I found myself not feeling sad, but feeling grateful that I even had the opportunity to come back to Ghana, and to come back in a way that was meaningful to me and to others. I feel lucky that I might be able to give back to the country that has given me so much. I feel appreciative to everyone and anyone who has contributed in any way to our time not only in Ghana, but to The Footnote Film Project. Meda ase means “thank you” in Twi. Meda ase to the huge group of people who believed and encouraged us to follow through with what was, at one point, only an idea. As I boarded Delta flight 479, I could really only feel gratitude, and not sadness. My mom used to tell me that “as long as you feel thankful, you will never feel disappointed.” As we left West Africa, this statement couldn’t have been more accurate. What better a way to spend Hannah’s birthday (she’s twenty-three!) than with a seven-hour bus ride from Kumasi to Dodowa. Complete with new packages from our families which we picked up in Accra (which brought Hannah birthday surprises and landed me a new pair of sorely-needed tennis shoes), we arrived in Dodowa. After a long afternoon of getting ourselves settled back into Dodowa, it was time to have dinner with Charity and the family. Hannah, who was exhausted and hadn’t had much of a fun birthday (with the exception of a few new African dresses), lit up and had an amazing night. The kids were so sweet to her – even forming a line and singing ‘happy birthday,’ followed by a rousing chorus of ‘hip hip hooray!’ We had a great night and I think Hannah’s birthday was completely salvaged by some good food, close friends, and the energy of a crowd of Ghanaian children. On top of everything, the family gave Hannah and I some really neat gifts. In honor of Hannah’s birthday, they had a whole bunch of clothing made with the same (gorgeous) fabric. Using the same seamstress who has created clothes for both Hannah and I, they were able to order us custom-made shirts and dresses (myself and Hannah, respectively) for us and a bunch of tiny matching shirts for the boys. Emma (pronounced ‘Eema’), Elvis, Hannah, and I were all matching. Hannah grinned from ear to ear. It was the perfect gift. The next morning (Jan. 25), we had another nice meal with Charity and the family, during which Hannah showed off her new threads. We spent the rest of the day organizing data and getting some errands done. With all of the travel we’d been doing, it was hard to get some of the more mundane day-to-day tasks finished that were pretty important. Clean underwear is always a high-priority item. Sunday morning was an exciting time for us. Oti, who is quite religious (along with a large majority of Ghana), invited us to visit his church near Accra. Unlike some of the more quiet and reserved services you might expect, the morning was a chorus of shouting (sometimes in tongues), group singing, and sporadic shouts of praise from across the room. The energy was fantastic. We had an amazing time and I ended up getting into it a little too much – I think I embarrassed Hannah with my (very awkward and robotic) dancing. At one point, however, Hannah just had to shout out to the lord, collapsing in a hot mess of tears and emotion. Ok, fine. It wasn’t exactly a religious outburst: Hannah’s foot was sitting underneath kneeling board (on the pew) when a large woman knelt to pray. Hannah shouted out, her cries dwarfed by the crowd of ecstatic worshipers. By the time I could figure out what was wrong (it was quite a confusing moment), I found myself trying to get this large woman off of Hannah’s ankle. Even with the help of another church leader, this woman – unaware that she was being supported by a small, fragile, size six foot – couldn’t be roused from the depths of her cathartic prayer. We finally had to simply live the pew, with her on it, and free Hannah ourselves. Looking back on it, it was quite a funny moment – but at the time, I thought Hannah was going to rip someone’s head off! Luckily, though, Hannah wasn’t too embarrassed, since most of the church had no idea that their collective cries of divine thanks included Hannah’s cry for help. After church, we headed to Gloria and Alex’s house. The couple, friends of Hannah’s from the Dodowa Health Research Center, were celebrating their anniversary and treated us to a delicious meal of kenkey – ground maize pounded into balls and wrapped in the husk. It tasted like a very tough ball of banku, but I enjoyed the flavored pepper that accompanied the dish. We inadvertently interrupted an improvised choir group, resulting in a neat serenade as we enjoyed our lunch. After a long afternoon of intermittent napping and fun conversation, we headed back to Dodowa. Monday (Jan. 27) was a nice, slow day. We were able to sit down with two great families and really get to know them. It took some time, in both cases, to get the settings just right, but we enjoyed the opportunity to build some nice, personal connections to the folks we met. 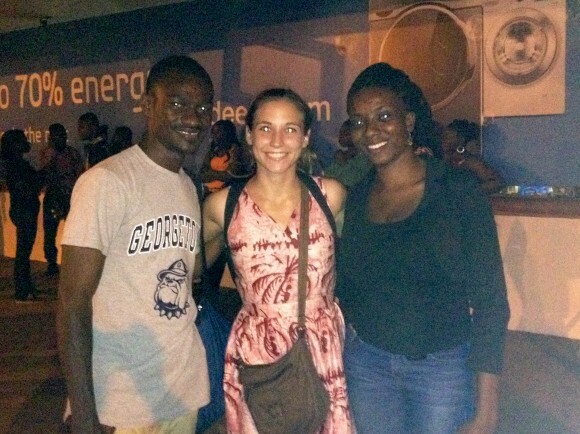 Our first stop was with a Nigerian man who married a Ghanaian woman. In a relationship where love knows no language, they both speak in English to communicate. 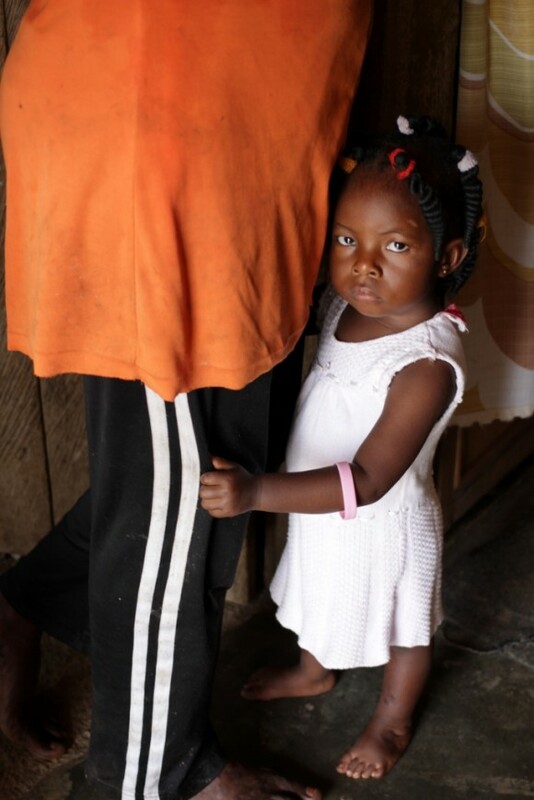 Their adorable daughter, Sonya, was born with unilateral clubfoot and was in treatment incredibly quickly. She runs and plays like any other child and is really remarkable when one remembers that she was born with one foot pointing ninety-degrees away from the norm. She’s an only child, so she’s used to being treated like one of the grown-ups. Our second stop was with a mother who has had two children born with clubfoot. Her son, Alexander, was terrified of his doctor (as most children are), and we just happened to have him along with us. 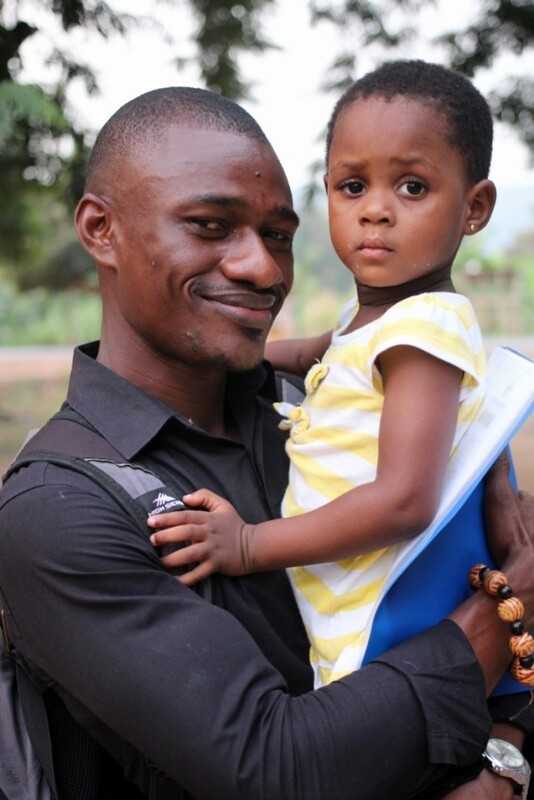 While Joseph Acheampong isn’t a physician, he’s a skilled Ponseti practitioner who works with both CURE and FOCUS (another clubfoot-related organization in Ghana) as their quality assurance man-on-the-ground. He travels extensively throughout the country, ensuring that the Ponseti Method is being performed correctly by surgeons, technicians, and nurses. One of the many children he sees on a regular basis, though, is Alexander. And little Alex, was not thrilled to see the man who puts him in heavy plaster casts. Struggling to get even a smile out of him, Hannah sprung into action, suggesting that Alex might smile if he were awarded a lollipop. After a cautious approach, he carefully took the candy from my hand and went at it. The ploy worked, and soon he was cooing and giggling at everything Hannah did. Without a doubt, though, the best thing we did to allow Alex to open up was to keep Joseph out of sight. His sister, only six months old, has just graduated to the ‘bracing’ phase of her treatment. Each night, they both put on their boots and bars (with help from mom) and sleep themselves closer to plantar-grade feet. Our interview with their mother was really fascinating. I’m always interested in learning more about the feelings that mothers experience when they have more than one child with the special needs required of someone going through the Ponseti Method. To my surprise, she was very candid about the relief she experienced when she found that her daughter’s deformity was the same as her sons. In her mind, she told me, it was a condition for which she already knew treatment and could handle the challenges. She did talk about how much better she felt when her second child was diagnosed with clubfoot, though, and how much her awareness of the Ponseti Method kept her fears to a minimum. It was an insightful interview and I’m excited to review it again during the editing process. After a nice dinner with Charity, we threw down our gear and slept – we had a big morning in Dzodze the next day and it was going to be even more exciting than either of us expected. We woke up bright and early embarked on our day trip to Dzodze, which is about three and a half hours from Dodowa. We went with Andrews and Eddie, Charity’s sons. Andrews acted as our faithful driver and Eddie was a great translator – we needed someone who spoke the local ewe dialect for this particular region. The road to Dzodze was somewhat expensive: there’s nothing quite like being pulled over by the police for the sole purpose of slipping them a nice little bonus. To avoid being held up for a long time as the officers ‘inspect the vehicle,’ the driver often just slips them a bit of pocket change and – just like that – you’re on your way. Interestingly enough, the officers taking our money with AK-47’s slung over their shoulders didn’t see the irony in warning us about armed robbers on our route. We finally reached the clinic we’d be visiting in Dzodze, a small group of (at most) four patients. After a bit of filming and a couple of great shots later, we ended up taking one of the patients, Joyce, out to lunch and bringing her back home for a personal interview. 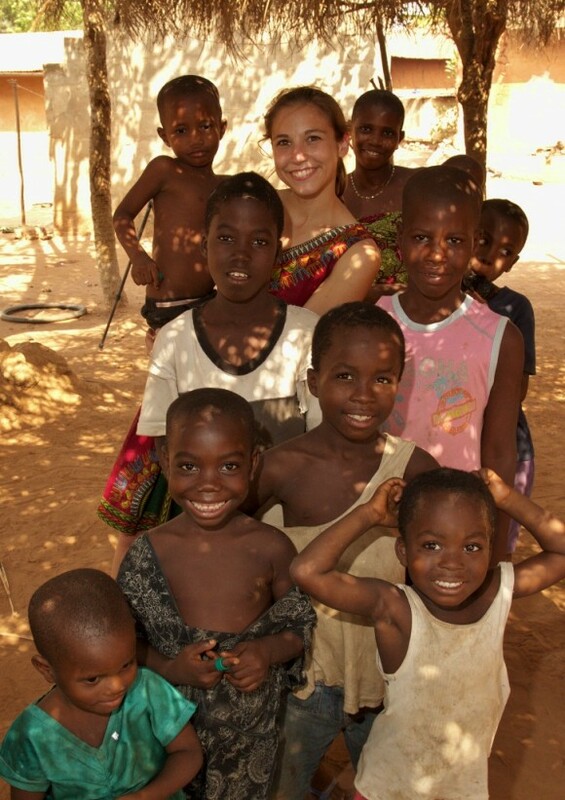 Her rural upbringing piqued our interest and she had such a kind heart and a bright smile. Arriving at her home, we realized we were in a small village populated by people who lived off the beaten path, quite literally. After Andrews nearly destroyed his car taking us over bumps and gutters that we hadn’t expected, we had ended up in a small village that wasn’t expecting us. Part of a protected tribe, they operate under their own laws and their own traditional societal ways. Next to an older man weaving away at homemade wicker baskets, a tribal elder sat and welcomed us to the village. She took a particular liking to Hannah, mysteriously tickling Hannah’s chin from time to time and giggling uncontrollably. We asked if we could take some photos and the whole crowd lit up, dancing and smiling as we took photo and video of the whole experience. They were so kind, bright and happy. It was one heck of a morning. Under the shade of a beautiful natural awning, we began our interview with at least 25 spectators. We got about half of the way into Joyce’s interview, in which we discussed her daughter Afi, before all hell broke loose. After our shot had been interrupted by chickens and goats, we finally found the piece to continue our interview – but not for long. Two women, one drunk from a funeral (as one does) and the other unable to have children, broke out into a sporadic and eventful argument. The second, telling the loud drunk to ‘shut up,’ was angrily insulted by the inebriated woman for her ‘barren-ness.’ The argument turned physical and soon the drunk woman, now having been called promiscuous by the other, threatened her counterpart with a large stick used to pound fufu. The village exploded as the sober woman brought up painfully sore subjects and took some cheap shots at the other. After they nearly knocked over my camera and gave us all quite a scare, the two women (the drunk one partially undressed and spitting) went their separate ways and we struggled to finish up our interview with Joyce. 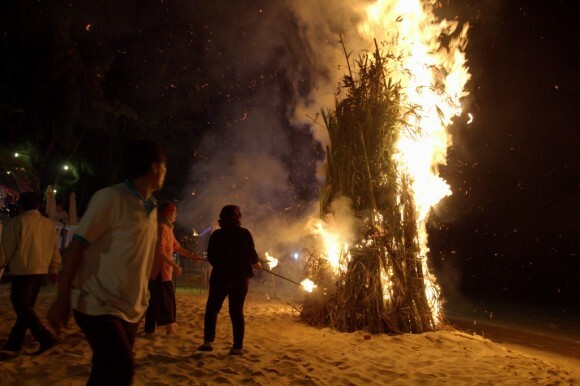 At the end, we were interrupted yet again as the sober woman shouted out, to the village’s shock, that she would be consulting the oracle that evening: asking the spiritual leader if death was an appropriate punishment for her drunken rival. If the drunk woman ended up dead (by whatever circumstances) after an affirmative response from the oracle, it would be legally accepted. 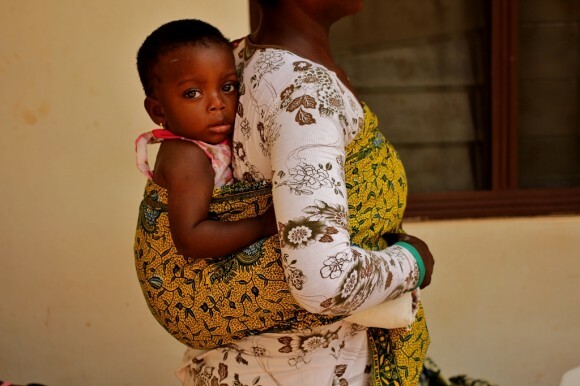 Tribal laws are harsh, but protected by the Ghanaian government in an effort to allow the groups to remain independent. It was quite the scene and very different from how our time with the villagers began: dancing, taking photos, and laughing with them. Eddie, our translator, told us that he thought the fight broke out because the two women were jealous of the attention we gave to Joyce – they wanted their own bit of attention and, sure enough, they got it. 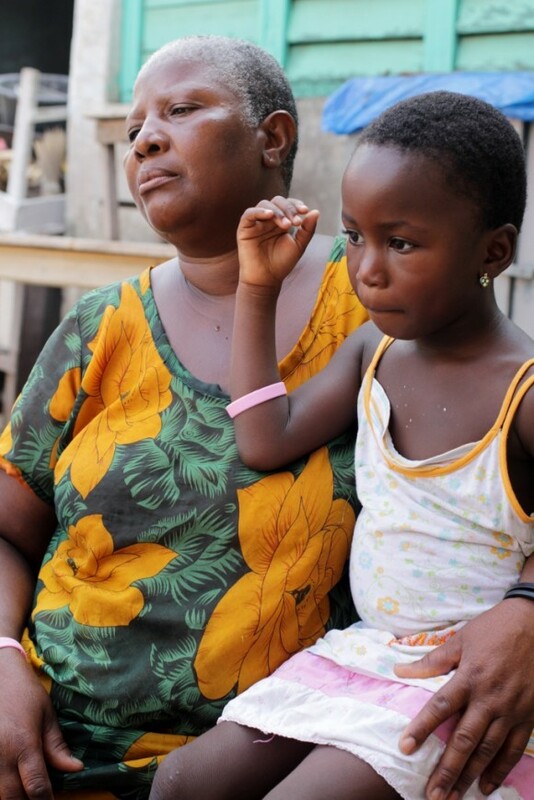 It was amazing how the shy and sweet Joyce turned her child’s condition, with our presence, into something the women in the village found unique and special. We got out of there without much fanfare and headed to our second interview of the day. 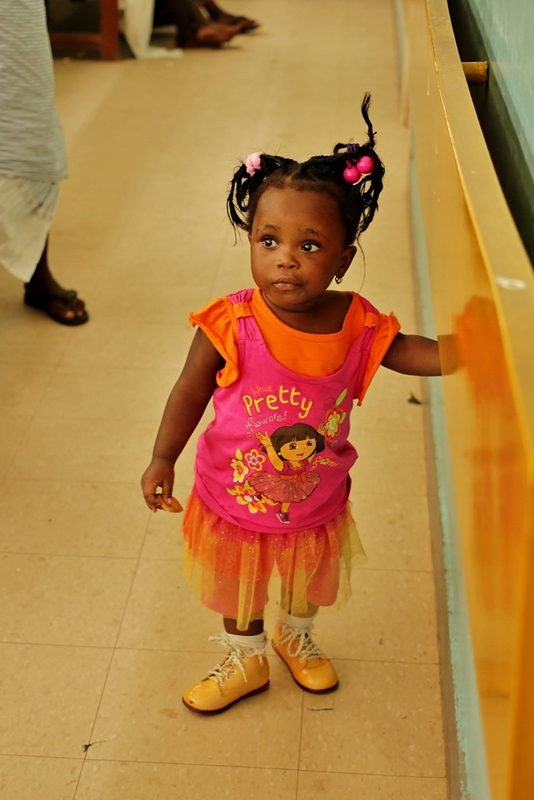 Earlier at the clinic, we had – completely by chance – run into a woman with an untreated case of bilateral clubfoot. She had scars from years of walking on her knees. Charlotte, a bright woman with an infectious smile, was waiting for us nearby and we met with her briefly. She was so sweet, but was very reluctant to answer our questions once we sat down for the interview. I suspect that her family, all present, put an awkward pressure on her to say or do certain things – and they flat out refused to give us a private moment with Charlotte. In that moment, we were both disappointed that her family had allowed us to come out of their own curiosity, but hadn’t allowed us to really have the privacy with Charlotte that she clearly needed to answer honestly about her struggle. We enjoyed a late-night dinner on our way home (during which we encountered more ‘helpful’ police officers who lightened our wallets with a smile). It had been a long day – and it was a wild time that we couldn’t have seen coming! Since it was Emma’s birthday, we decided to throw him our own birthday party. We had missed his actual birthday, since we had such a late night prior, so we decided to really go all out. 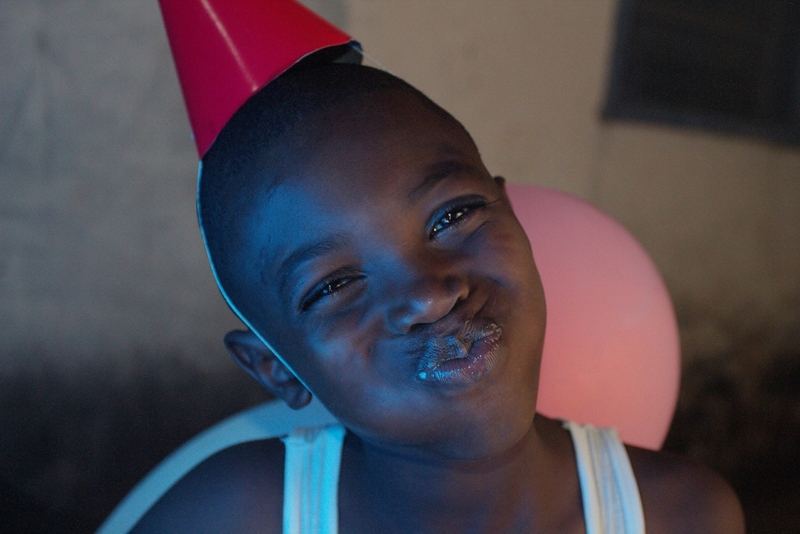 Complete with ice cream, candies, and birthday hats, we set up a party in just a few minutes with the help of all of the other children. While I hung out with him for a few minutes, Hannah ended up coaching all of the kids as they blew up balloons, set out the party hats, and laid out birthday noise-makers. Of course, the noisemakers didn’t last long as simple toys: I made the mistake of poking Hannah in the ear with the noisemaker as a joke – but that turned into all of the kids literally attacking me for the next twenty minutes. While they would never jump all over Hannah (Ok, they would, but not as a punching bag), they have no problem treating me like a sack of potatoes. And Hannah loves to watch them have at me! As is Ghanaian tradition (we learned), Emma was doused in cold water by the whole crew and he took it well. We ended up getting a ton of great photos and having a great night with all of the kids. On Tuesday January 21, Zach and I met up with Jerry in the morning to go and interview even more patients. He took us to a nearby home where we met a little baby boy named Junior, his adoring mother, Yaa, and his grandmother, Sarah. 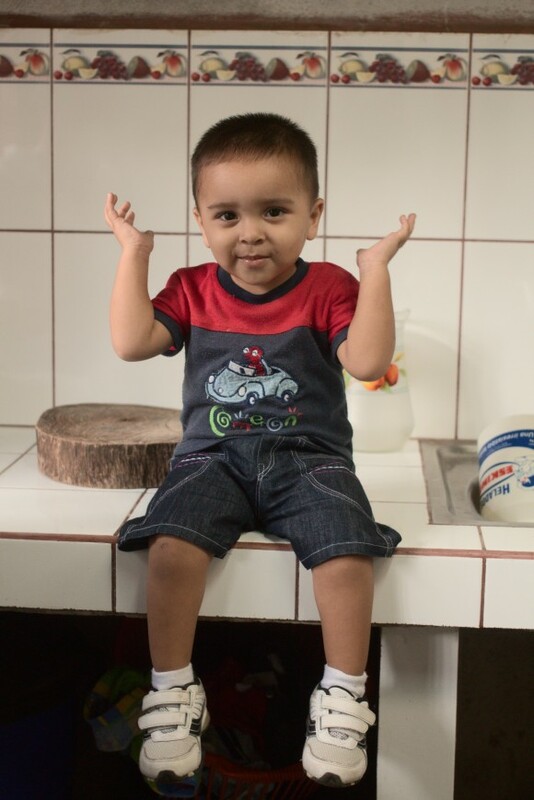 He not only has bilateral clubfoot, but also clubbed hands. All four of his appendages were casted. Junior looked up at us with awe as his proud grandmother, regardless of his plastered hands and feet, showed her grandson off to her guests. We immediately made a connection with both Junior’s mother and grandmother. Unfortunately, it took us a while to get our equipment set up. As soon as we started the first question, “What is your name?” we realized we ran out of space on our audio recorder and had to reformat a new SD card so we could capture the mother’s story. Fortunately, Junior’s family was incredibly patient and didn’t mind waiting for us to get these technical issues sorted out. After at least 30 minutes, we were ready to start our interview with Yaa. Zach and I were glad we made the extra effort to make sure our equipment was set up properly because talking with Junior’s mother was extremely insightful. We talked to her for over two hours. Yaa freely expressed some of the struggles she’s experienced in a way that, even though her child is just within the first few weeks of treatment, made us feel like the worst is already over. She told us that she was positive that her husband would have left her if there were no affordable treatment for her child. 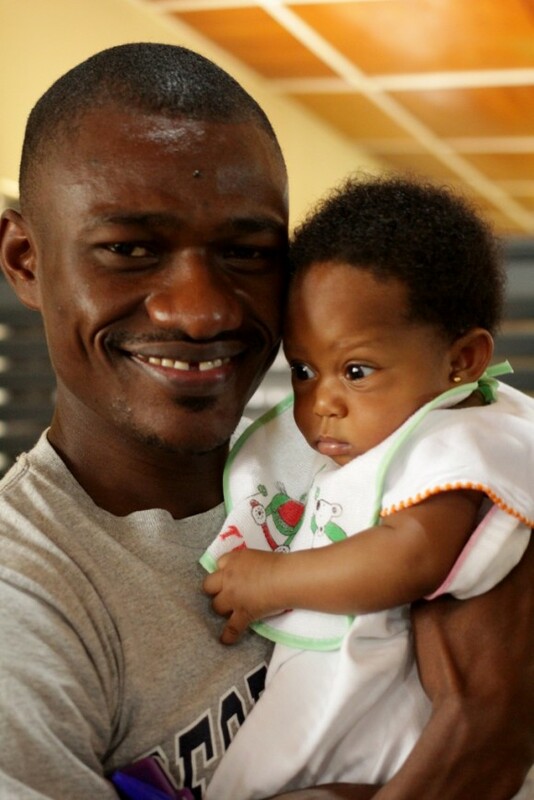 Yaa’s husband has blamed her for their son’s condition. 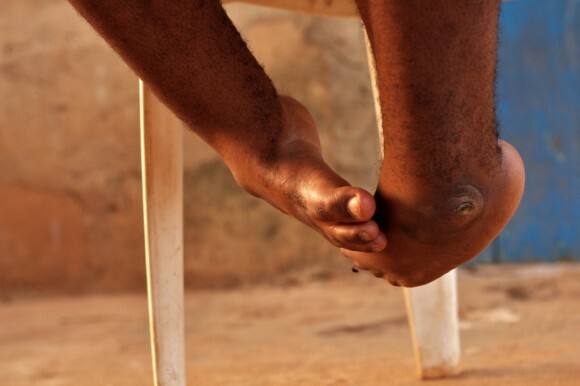 As we have often heard throughout our travels, mothers tend to internalize this external blame and feel guilty for “causing their child’s clubfoot.” Yaa was no different. She told us that she changed as a person in the first couple of weeks after her child was born. She went from a positive person, to one who was negative and easily angered. Not only was she a new mother, experiencing the struggles of having to take care of a new baby, she was worried that her child may never have a future as an independent adult, that she, herself, may never have a future with her husband, and that she was to blame for all of this. I think that any of these challenges alone are enough to bring a person down, not to mention all of them at once. As we were concluding our interview, the two matriarchs asked how much the treatment would cost. Jerry explained that CURE provides free treatment. Yaa and her mother were overjoyed. They said that Yaa’s husband was currently out working just so they could make sure they would have enough money when the bills came. 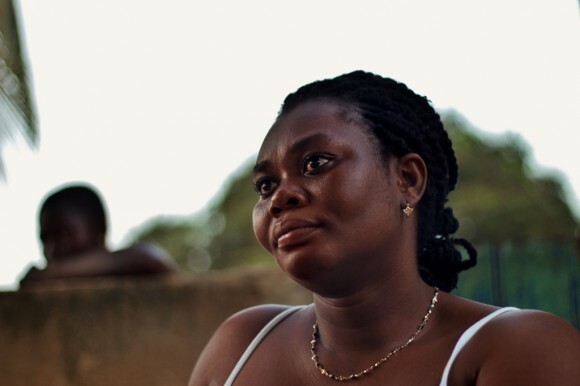 We semi-joked with Yaa that she shouldn’t tell him the treatment is free until later – to get back at him for threatening to split up the family when Junior was born. I think Yaa and her mother really liked this plan. After exchanging a few more “jokes” about how I was going to take Junior back to the US with me when he gets older and how I am going to send the grandmother my used clothes so she can sell them in the market, we were on our way. It was about noon by the time we got into a taxi, so Jerry said we would stop and get some lunch up the street. We stopped at an unassuming building that looked like a tiny bar from the front. Jerry walked us through the bar and took us out to the back patio area. Here there were three men pounding fufu (a playdough-like ball of yam and plantain) and large vats of different types of stews, meats, banku (fermented corn dough balls), and omotuo (sticky rice balls). Jerry, Zach, and I are all partial to omotuo with groundnut (peanut) soup, so we all sat down with big clay pots filled with this delicious food. It was so flavorful and tasty – like melted peanut butter. As groundnut soup connoisseurs , the three of us decided it was of the best we’d ever had. Jerry informed us that people travel great distances to come to this restaurant, “Effe Fufu,” because it has a homemade atmosphere and taste. Zach and I left the restaurant feeling more than satisfied. Our second, and last patient of the day (since our first interview was so extensive), was a one-year-old boy who was not only afraid of us ‘obruni’ strangers, but even more terrified of Jerry’s height. His shrieks of fear were so contagious that his older cousin immediately started crying when he saw us. Since all three of our presences were clearly needed for the interview to take place, and high pitched, panicked crying isn’t conducive for a documentary audience, I started wracking my brain for a way to calm the children down. My usual solutions for these situations, like peek-a-boo and giving out wrist bands were not working. Time to innovate. What is one thing which most children love that they cannot cry and enjoy at the same time? Lollipops. I rushed to the nearest stand and bought their entire stock. In no time, Zach and I achieved our peace and quiet and started our interview with the patient’s mother, Angelina. Angelina told us that her son started the Ponseti Method late. He just begun treatment just a few weeks ago. 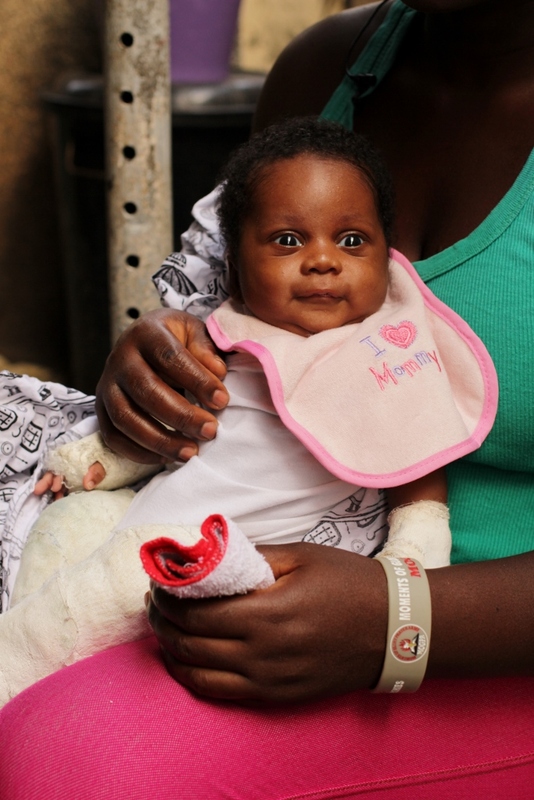 After Angelina gave birth to her son, a doctor (inaccurately) told her that the clubfoot could be corrected, but that he wouldn’t be able to start treatment for a few years until he was older. Angelina didn’t want to wait that long. As far as she knew, modern medicine had no immediate solution, so she decided to pursue traditional medicine. 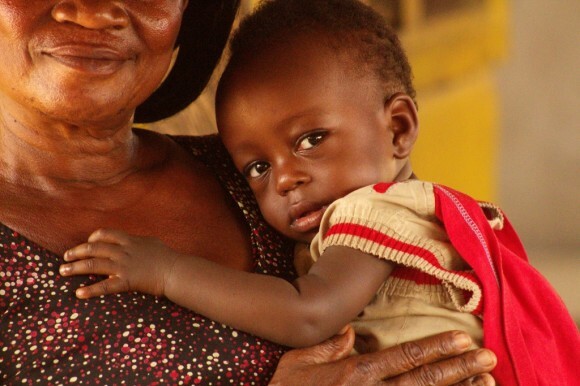 Over the course of the last year, she brought her son to the traditional doctor in hopes of curing the clubfoot, but the attempt was unsuccessful. She stopped that traditional treatment practice when she realized it was just costing her family time and money, without any progress. 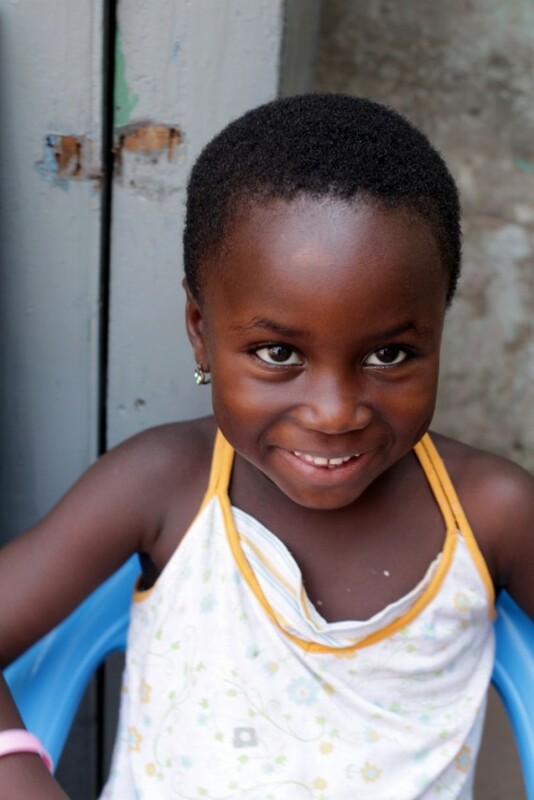 Luckily, Angelina found out about the Komfo Anyoke clubfoot clinic and the free treatment. She brought her little boy there, where he is now receiving treatment. Our interview with Angelina also revealed something else though that isn’t as much important to our documentary, but important for her son’s future. She told us that the technicians had casted him only once, before putting him into the boots and bars. At this point, we’ve seen enough cases to know that unless its an incredibly mild case in a newborn, only one cast isn’t enough. 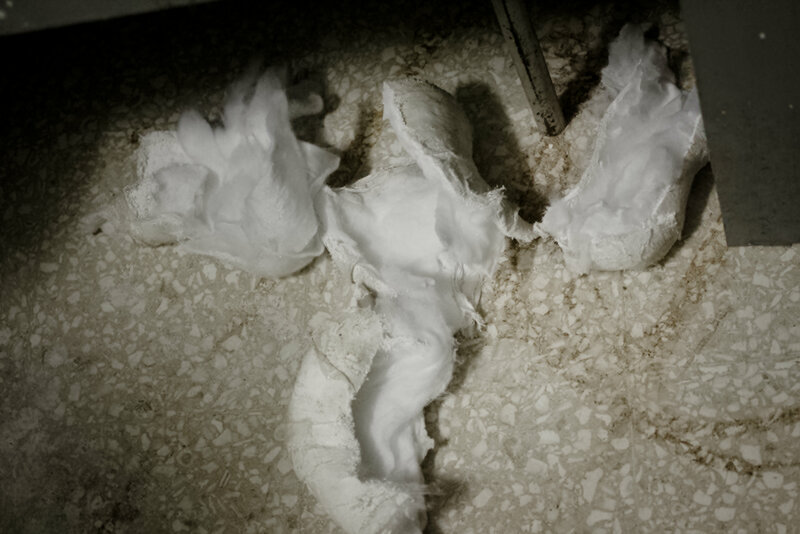 We expressed our concerns to her, and concluded that because her child is older and his feet looked so improved after his first casting, that there was probably some mix-up. The technicians likely assumed he was further along in treatment than he actually was. Jerry immediately contacted the hospital on this matter to see if things could get sorted out. Around the time the interview finished, school was letting out, and children flooded the community in which we were. I gave away the last of the lollipops and took some pictures of a gang of boys, including Angelina’s other son. Soon, the group of young boys had come into Angelina’s drink shop and were around Zach and Jerry dancing to Gangnam Style. 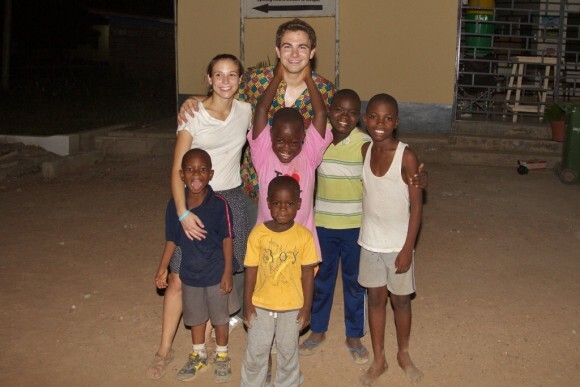 It was funny to see lanky Jerry and ‘obruni’ Zach dancing with the incredibly coordinated Ghanaian children. When the excitement died down, we said our temporary goodbyes to Angelina’s family, because we would see them the next day at the Komfo Anokye clubfoot clinic. 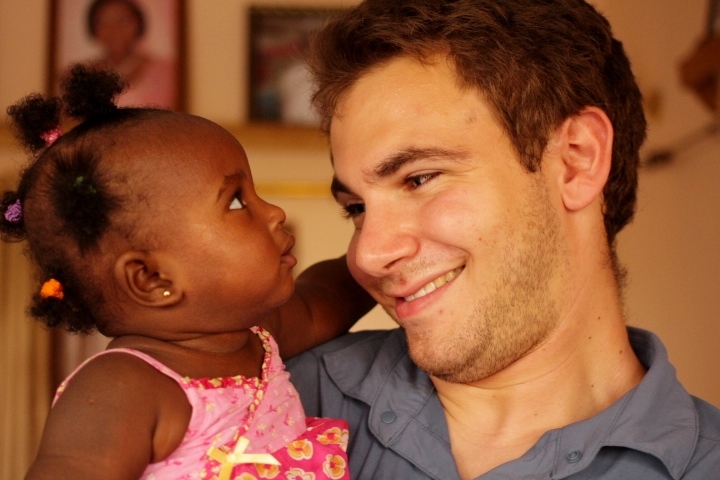 The next day Jerry took us took us to the Komfo Anokye Teaching Hospital, one of Ghana’s largest hospital complex’s. Its also home to Ghana’s largest clubfoot clinic. When we arrived at the Physio department, the technicians were busy preparing for the large load of crying babies they were about to receive. Zach volunteered to help them out, to which they responded by handing us knives and rolls of plaster to be cut into baby-sized pieces. Although this went beyond the scope of our documentary making, we were glad to help out in a small, but tangible way. A short while later, after talking to the Department Head about his ambitions for further developing the clubfoot clinic, the babies started to pile in for casting. A young female doctor pulled out a laptop and started conducting a presentation on the Ponseti method for the audience of mothers (and a few fathers). 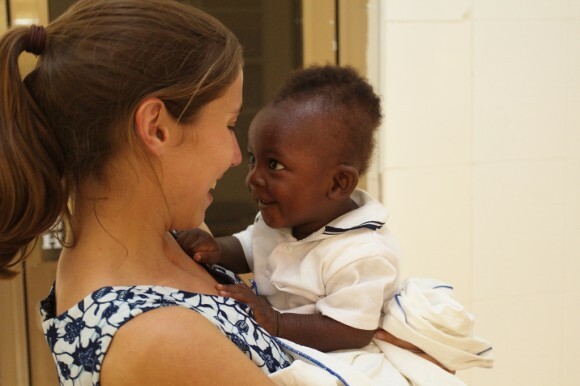 We were told that she was a volunteer that helps out with some of the counseling from time to time and that her presence has been invaluable for keeping mothers calm and patients treated. After the presentation, we followed the first few patients into the casting room, which actually was a large multi-purpose, physical therapy room. But for this amount of children, a small exam room just wouldn’t do. We watched as patients were called over and placed on a large table, not one at a time, but all at once. In the middle of the table was the plaster and padding, and on the edges were the patients. It was quite a sight. It was a plaster party, if only the music could be something other than the sound of screaming children. At full speed, there were five children all being casted on the same table, each with their own team of casting technicians. At one point I heard a familiar panicked cry, and looked over to see that Angelina’s son was being casted. I don’t think I’ve ever been so happy to see a child cry so hard. I was glad that he was finally getting the consistent care that he needed. I also made a point to spend some time with Junior and Yaa. Yaa was unfased by her son’s cries on the table, not because she is callous, but because she displayed a confidence that she no longer worried about Junior’s future. 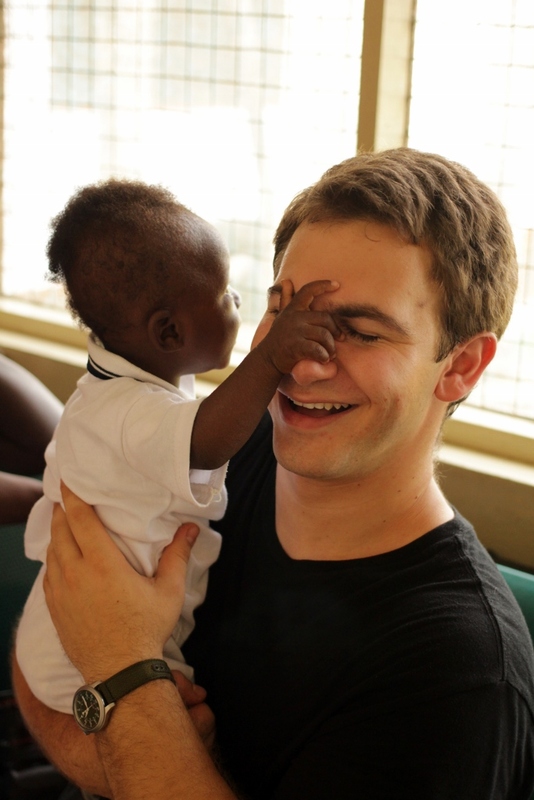 When our ears had reached their limit, and we could no longer handle the orchestra of screaming infants, Zach and I settled in the waiting area and talked to the counselor, Emmanuel. He told us that prevention is one of his passions, whether it’s Hepatitis B or a lifetime of disability. We hadn’t yet gotten an interview with a counselor yet, so we asked if he wouldn’t mind being interviewed. Clearly a very humble man, he immediately called the young doctor from earlier in the morning over and introduced us. Her name is Abby and she’s a resident at Komfo Anyoke. She spends hours each week at the clubfoot clinic, checking children for other conditions, as well as consoling mothers’ worries. Emmanuel insisted that he be interviewed with Abby, a suggestion we welcomed. 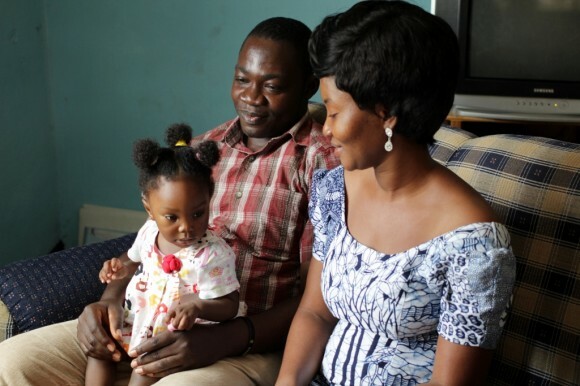 Because Emmanuel and Abby are intimately involved with clubfoot, but aren’t actually experiencing the treatment directly, their perspectives proved to be incredibly unique. 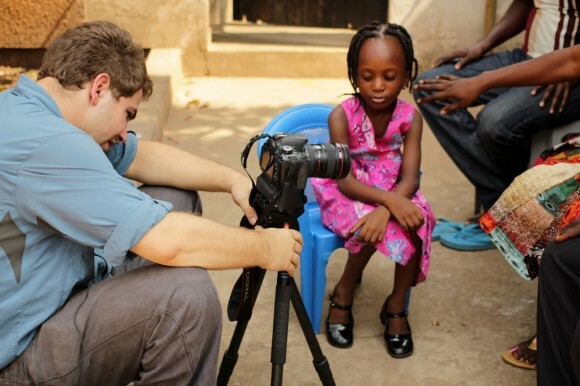 They understood, unlike many of the mother’s we interview, that viewers (of our film) at home have never been to Africa and may not understand why being disabled in Ghana is so problematic. 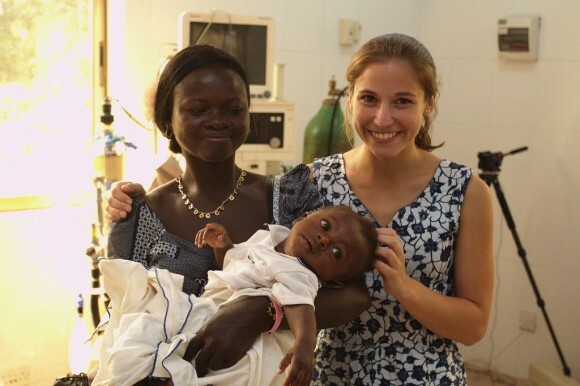 Abby outlined the life of a Ghanaian child with neglected clubfoot with an incredible level of detail. She talked about how in a family with limited income, the few resources available often are focused on able-bodied children, and that the child with clubfoot is neglected in more ways than one. 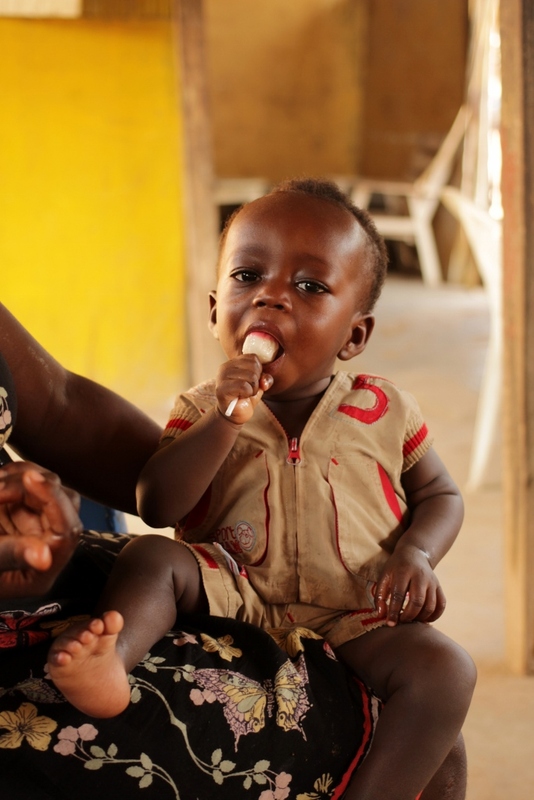 Emmanuel said that clubfoot treatment changes a child’s position in the family from being a “liability” to being an “asset.” Essentially, he was saying that such children will no longer be costly, but can be productive, contributing citizens to Ghanaian society. Together, I am sure Abby and Emmanuel will have a place in the final film. Their interview was unforgettable. Zach, Jerry, and I ended the day early and headed back after lunch to the hotel to catch up on some work. 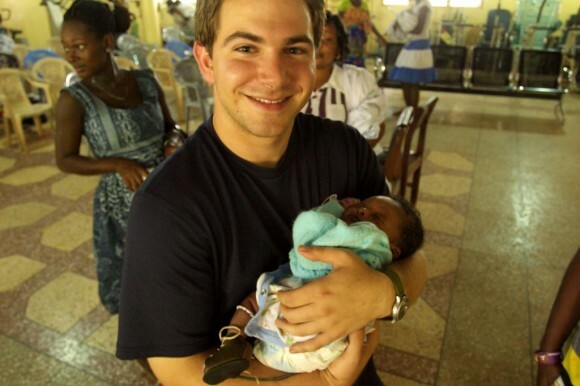 The next day we went to St. Michael’s hospital outside of Kumasi for their clubfoot clinic. When we arrived, we were scared that our plans had fallen through. The clinic is much smaller than the one at Komfo Anokye, so small that usually it’s scheduled for the afternoon. However, we finally found the clinic, which had been rescheduled for the morning for us to film. When we walked in, we just saw a few mothers lined up with their babies. There wasn’t even a casting room for the clinic, so a table was set up in the hall. One mother in the line stuck out to us, though. She had a constant smile on her face. Even when she wasn’t smiling with her mouth, you could see it in her eyes. Joseph arrived at the clinic a few minutes after Jerry, Zach, and I. He was there to perform the casting and evaluations for the day. He pointed to the mother with the beautiful smile, and said “Both she and her child have clubfoot. Her’s is neglected, but her child is receiving treatment.” She saw Joseph point over to us, and she lifted her skirt off the ground a few inches to reveal her foot, twisted 180-degrees from the natural direction. We were shocked. If Zach and I were told to guess which out of the ladies in the waiting area had neglected clubfoot, I am sure she would have been our last choice. Not just because her foot was hidden behind her long skirt, but because her foot was concealed by the most genuine smile. It didn’t take us long to realize why she was smiling. While most observers might wonder how having a lifetime of both physical and emotional pain can lead to such optimism, Georgina doesn’t see her condition as a reason to be pitied. Additionally, the amount of joy she feels is palpable when she sees that her son, Edward, won’t have to struggle like she has (although she doesn’t even describe any moment of her life as a struggle). As you can probably tell, she took priority over our clinic visit, and we made sure to find a quiet place in the hospital to sit her down for an interview. It was difficult to get Georgina to tell us about times she felt upset about her condition, not because she is embarrassed, but because she doesn’t think about her life or her foot in that manner. She seems truly thankful for all that she does have, and doesn’t seem to dwell on anything that isn’t perfect. We asked her if she ever stops smiling, and she said “Never, because there is always something that makes me happy.” Georgina is truly an inspiration individual. In between optimistic statements, we were able to unearth the harder parts of Georgina’s story. She didn’t realize she was different until she was in school. As a young girl, her peers didn’t seem to notice or care about her foot. At school, when she was about ten years old, though, her classmates started picking on her and bullying her for her clubfoot. She went home and asked her parents how her foot could be fixed, but they responded that they didn’t have the money. Because of this, and the long treacherous walk, she stopped going to school. Georgina said that failure to finish school and the limitations clubfoot has on mobility, have really constrained her job opportunities. She makes money now by selling chilled water outside of a school. Although she seems proud of her independence, I don’t think it’s an occupation she would ever wish for little Edward. 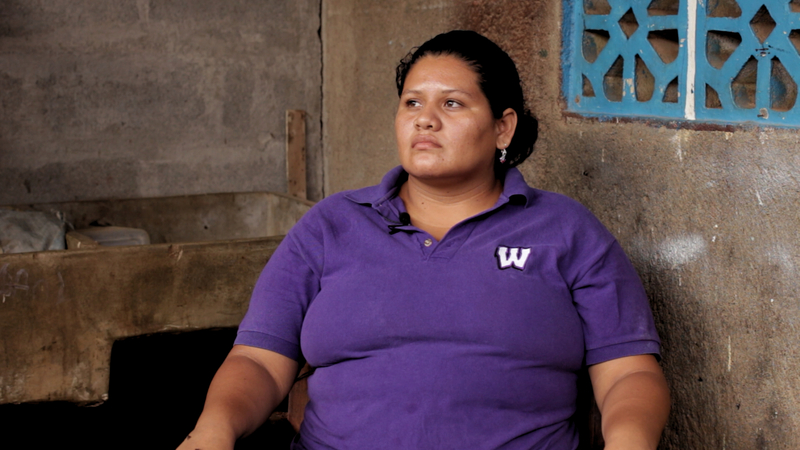 The last part of our interview with Georgina was centered more around her son. Her grandmother was the first to notice Edward’s clubfoot, remarking that his feet looked the same as Georgina’s foot had looked when she was born. 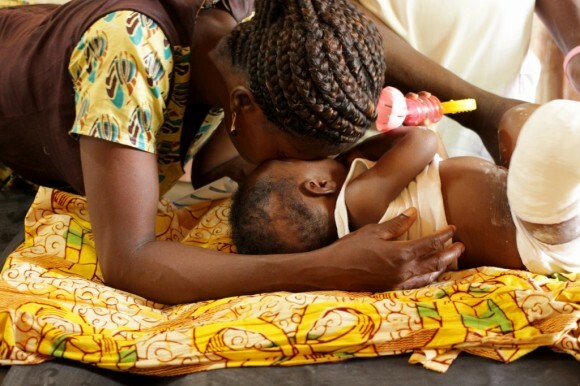 Georgina was crushed when she first found out about her child’s condition. She said that it was the happiest day of her life when she heard that Edward’s foot could be corrected, although she admitted that, at points, she’s felt conflicted because she wishes it were available when she had been born. But because she knows what can happen if the foot doesn’t get fully treated, she is truly dedicated to every step of the process. I am sure Edward’s feet will be straighter than my non-clubfoot feet – that’s how determined Georgina is about getting the best care for her child. I have no doubt that Edward will have an incredible future with such a devoted, positive, and passionate mother. Zach and I felt honored that Georgina took the time to speak with us. We always appreciate when parents and patients open up to us, but it takes a great amount of courage to talk about personal hardships in a country where disability is still not fully understood by the public. Over a week later, I still cannot find the right words to describe how grateful I feel to be the one to share her story and her perspective with the world. Our time investigating clubfoot in Kumasi ended with Georgina. We shared goodbyes and went our own separate ways. Zach and I packed up our gear and headed back to our hotel. We spent the afternoon preparing for Friday, a long drive back to Dodowa (and also my birthday). 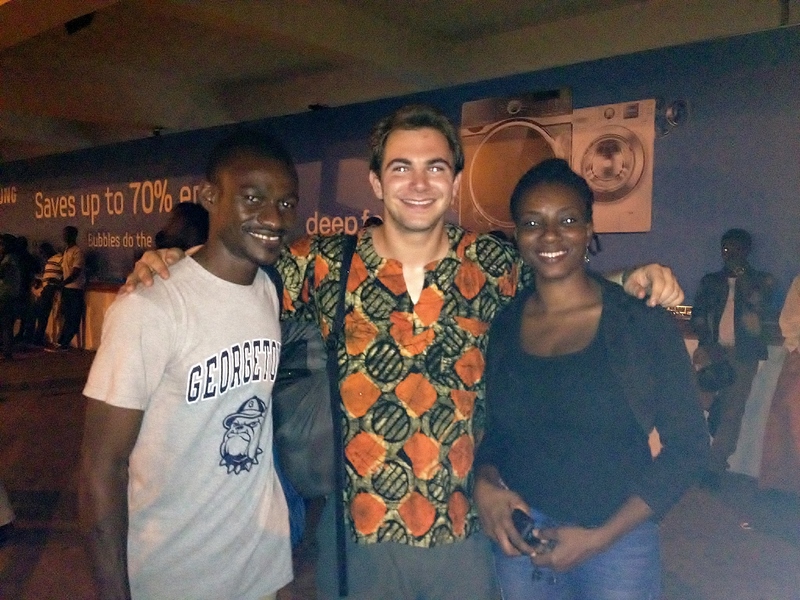 We wrapped up our time in Kumasi having dinner with Jerry and his wife, Jemima. We were so glad to meet the woman from who we’ve stolen Jerry for such a long time! 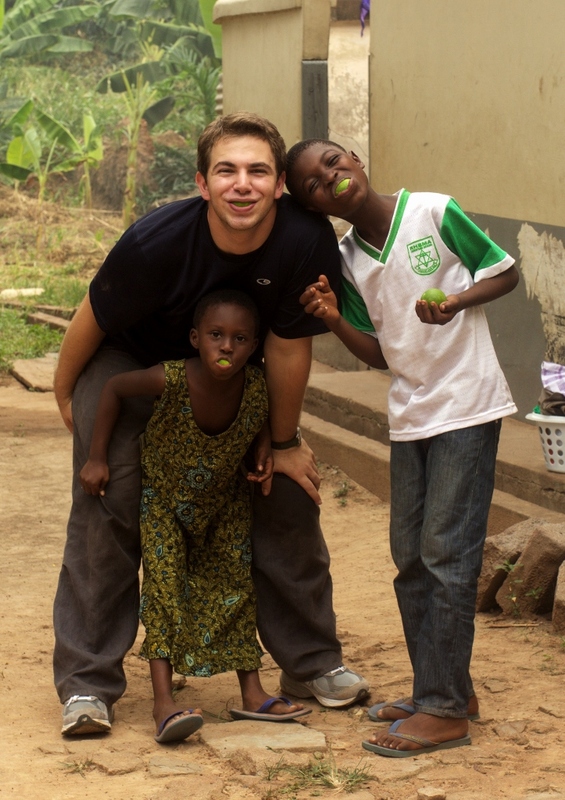 On the morning of Friday, January 17th, Zach and I set off for our next destination, Kumasi. 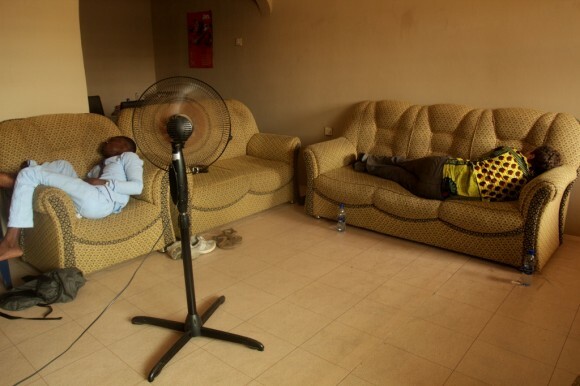 From our hotel in Sunyani, we took a taxi, then a tro-tro, and then another taxi which brought us to our hotel in Kumasi. Tro-tros are mini-buses outfitted to hold an additional 50 percent of people in comparison to the manufacturer’s original intention. Our (what was supposed to be a 12 seater) van screeched and bumped down the road with about 18 people for almost 3 hours. We made a few stops, each time the driver popping open the hood. Finally, we stopped and all of the passengers climbed out of the tro-tro. We stood outside of the car and watched as the diver pulled out a shredded, circular piece of rubber I guessed to be the timing belt. I guess we were close enough to Kumasi, because the car was almost empty when we finally pulled away after the tro-tro was fixed. Most people must have given up on this dilapidated vehicle which was well past its nine lives, and jumped into another taxi to bring them to their final destinations. Kumasi is considered to be Ghana’s cultural capital. Its the home of the Ashanti King. 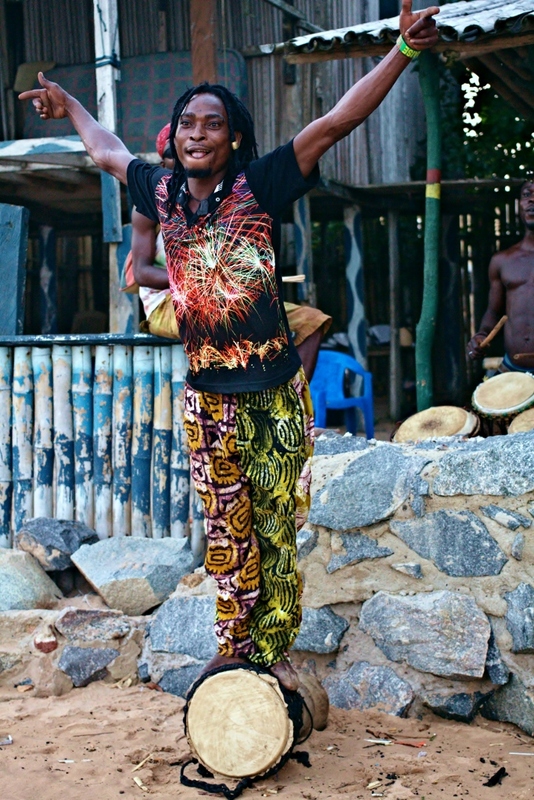 The Ashanti people are one of the largest ethnic groups in Ghana. Their native language is Twi, unlike other people’s in Ghana, who’ve just adopted Twi because the Ashanti’s are so widespread. 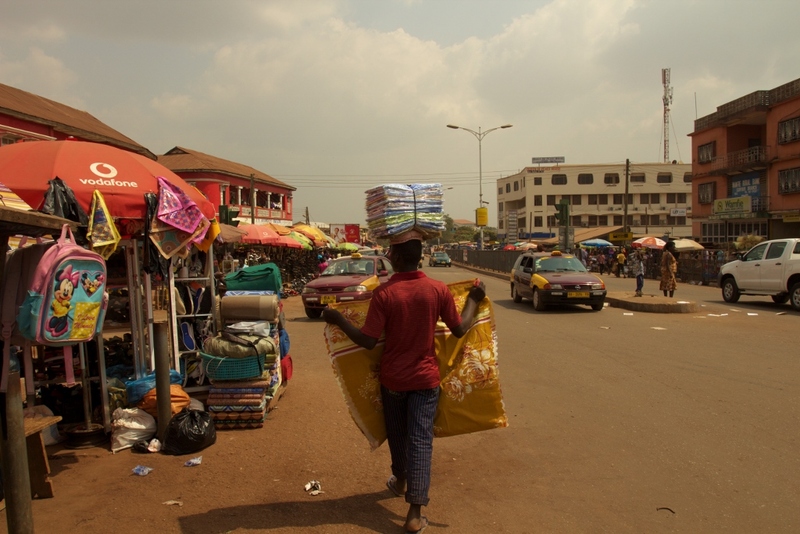 There are also many crafts which are unique to the Ashanti’s, like woven Kente Cloth, which bring tourists to the bustling city of Kumasi. For all of these reasons, I had planned for Zach and I to spend the weekend here. Although I just described a plethora of exciting things to do, Zach and I actually ended up taking it pretty easy on Saturday and Sunday. On Saturday we headed out to the Kumasi Cultural Center, which is a large park with many small galleries and craft shops. Zach and I peered in a few, and ended up in a small art gallery with a surprisingly large amount of paintings. While we were deciding what to include in our final purchase, the clouds opened up and rain poured out. It was the first rain we’ve seen in Ghana since we arrived. Zach welcomed the relief from the heat. When the rain eased up, we jumped into a cab. As we were heading out of the cultural center, we passed a giant funeral. We were told that it was the funeral of a famous Ghanaian actor, Eric Asante. There must have been thousands of people bustling about. Our taxi driver even pointed out a few other Ghanaian celebrities we’d never heard of. Zach was intrigued by such an event, but to me, it looked like a nightmare. I gently insisted that we just go back to our hotel and avoid the massive crowd, which mostly consisted of faux-mourners who just wanted to get their own peek at Ghanaian celebrities. 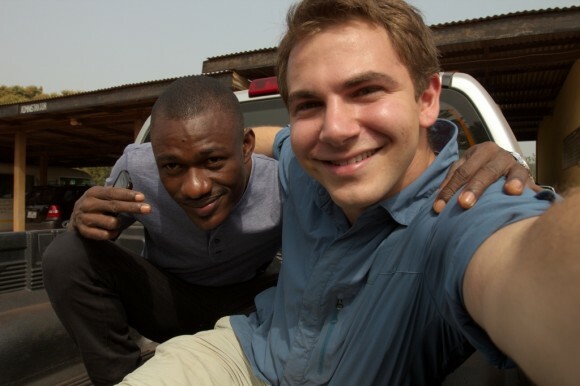 On Sunday Zach and I headed out for our second adventure in Kumasi. 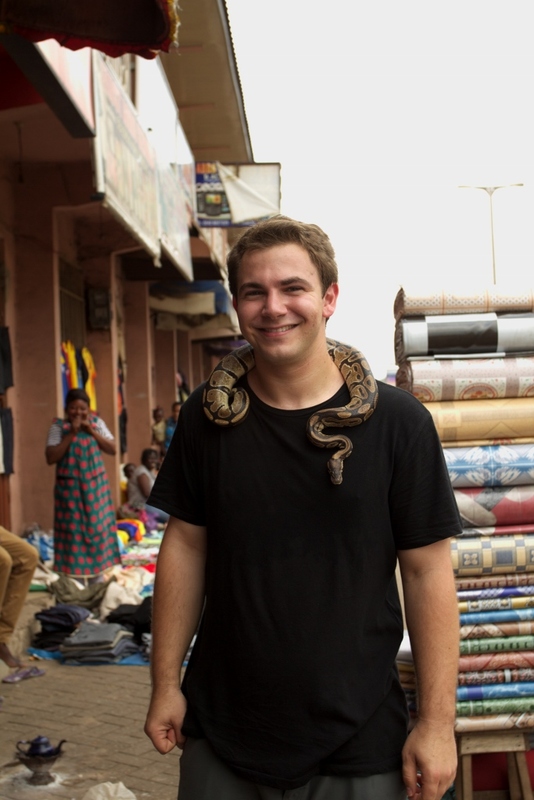 We went to one of the largest outdoor markets in West Africa. We walked through various sections, and shook hands with more people than we could count. as we were leaving the market, Zach and I passed some men with a variety of odd objects, set out on the street. I spotten a man holding a giant snake. He told us he was practicing traditional medicine (as were all of the other men) and then proceeded to put his snake on Zach, calmly explaining that it was a “python, but don’t worry, the fangs have been removed.” I laughed and took some pictures of Zach as he nervously asked if the man would take his snake back. Before I knew it, the roles had been reversed, and the snake was hanging off of my sholders, and Zach was snapping some photos of me. 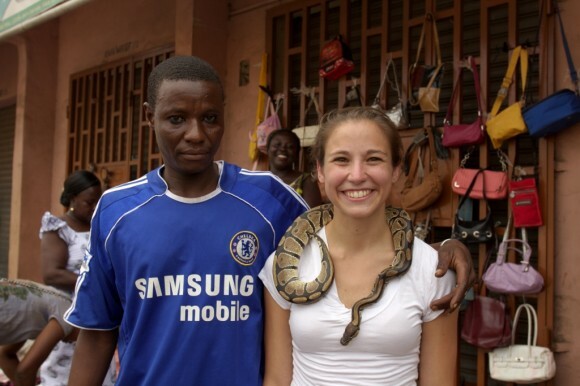 That was enough excitement for one afternoon, so when the traditional medicine man took his python back, we hopped into a cab to grab a bite to eat. On Monday morning we went with Jerry to our first patient’s house. She was a four-year old little girl named Elizabeth, or “Lizzy.” Lizzy’s story is quite phenomenal. She lives with her paternal grandmother and uncle. She hasn’t seen her mother since she was just a little baby, and she gets to see her father about once a month. Her parents split-up pretty soon after she was born. Lizzy’s mother took her away, but within a few months, the mother had handed Lizzy off to a relative, and was then passed down through other relatives before ending up with her paternal Grandmother. Zach and I interviewed the grandmother who reported the facts of the story, however Lizzy’s uncle and aunt added their own commentary, saying that Lizzy’s mother had probably abandoned her because of the clubfoot. But Lizzy got lucky. 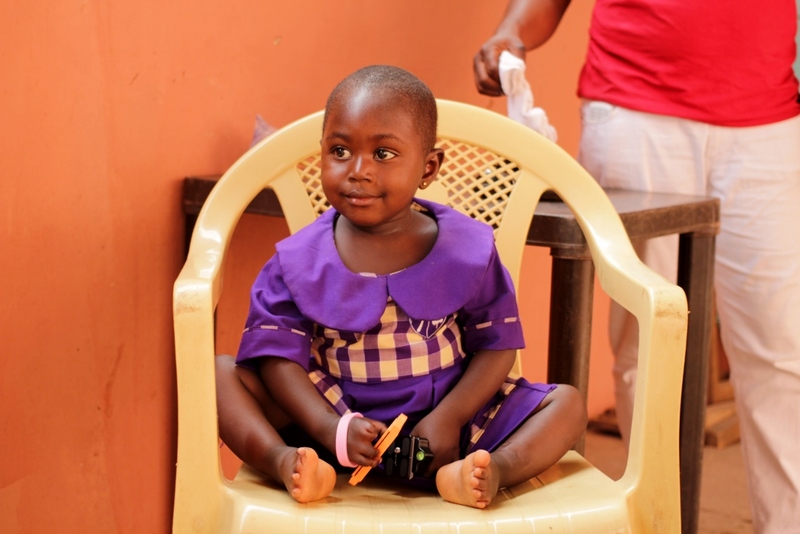 By coming to live with her grandmother, she was able to receive treatment at Komfo Anokye Hospital which has the largest clubfoot clinic in all of Ghana. Lizzy’s grandmother was very protective of her, and didn’t think twice about assuming the responsibilities of a primary caretaker for this young child. Lizzy’s feet look great. She seems just as unaware of her clubfoot as she does her abandonment. The family she lives with now truly loves and adores her as they would their own child. 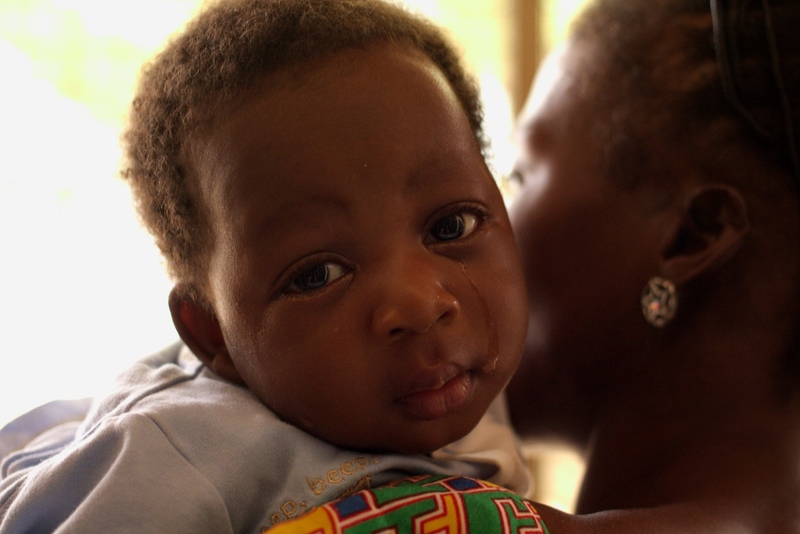 At the end of our interview, Lizzy’s grandmother revealed that she has heard the mother is coming back to claim her child – likely because she has heard that the clubfoot is now corrected. However, the protective grandma said that she will do everything in her power to keep Lizzy safe from her mother. After the interview concluded, we spent some time getting to know the type of person Lizzy has become. She is such a sweet little girl who loves to play. She taught us how to play her favorite game. I didn’t really understand the rules, but it involves a series of claps and jumps. Seeing her demonstrate the game triggered memories of Jerry’s youth, and before we knew it, six-foot tall Jerry had jumped in to play with four year-old Elizabeth. Lizzy walked away as the champion. Our second interview was not nearly as fruitful. 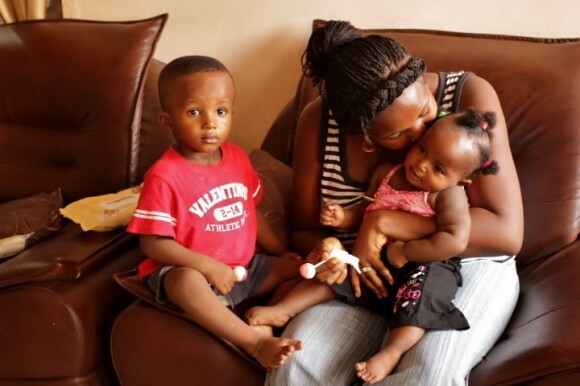 We interviewed Dinah, the mother of 3-year-old Neniah. 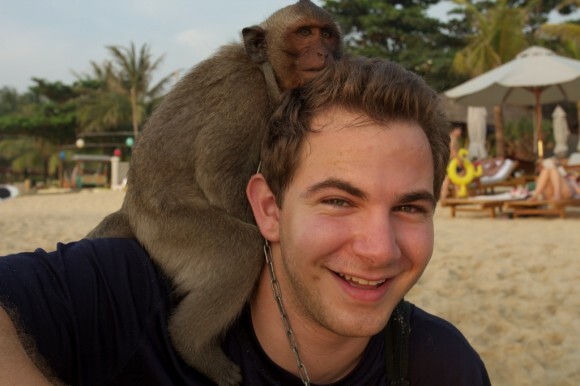 Joseph, the CURE employee in charge of quality assurance, had joined us and let us know that Dinah was one of his cousins! Neniah was skeptical of us strangers, and never could quite warm up to us. It was clear that Dinah wasn’t feeling well that day, and had trouble focusing on the interview. After asking our series of questions, we headed out to our final interview of the day. 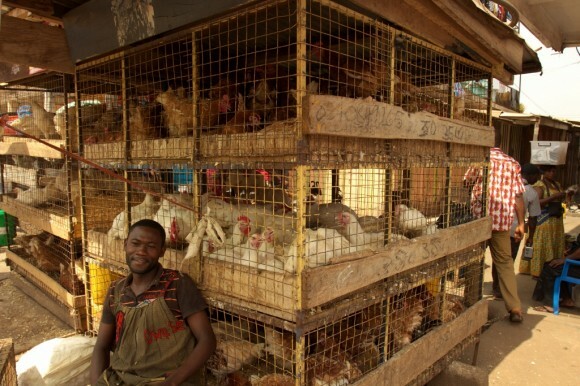 We arrived in the outskirts of Kumasi at a modest home with chickens running through the yard. We met 2 year old Phillipier and her mother, Janet. Janet welcomed us into their home, but once again, Phillipier proved to be another skeptical toddler. She gave us some serious stares which Zach and I knew we shouldn’t challenge. Joseph let us know that Janet and Phillipier were also his cousins. I asked if his family had a history of clubfoot, to which another relative responded that one of their common grandparents had a clubfoot. It was unclear whether this has inspired Joseph’s work, or if it is mere coincidence. I conducted the interview as Zach followed the little tyrant outside. He was successful in getting just a couple of smiles. I listened to Jerry translate the mother’s story. When we were in Vietnam, people were eager to tell us of the sacrifices they’d made to get their children treatment. 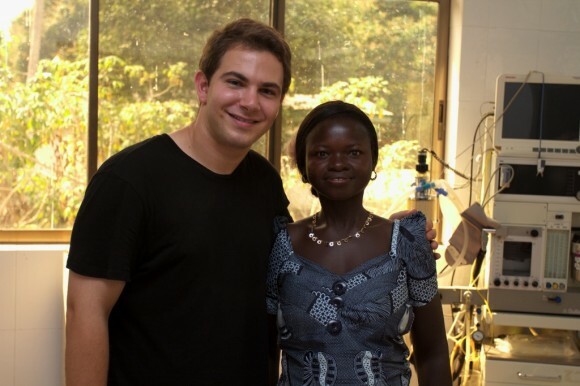 In Ghana, until I sat down with Janet, we hadn’t spent much time probing for these answers. Parents haven’t hesitated to thank CURE on camera for providing free treatment, saying that they wouldn’t have been able to afford such care otherwise. But maybe because our interviews have been mostly patients who live close to the clinics, and transportation is often the only real expense, we haven’t heard details about the sacrifices. 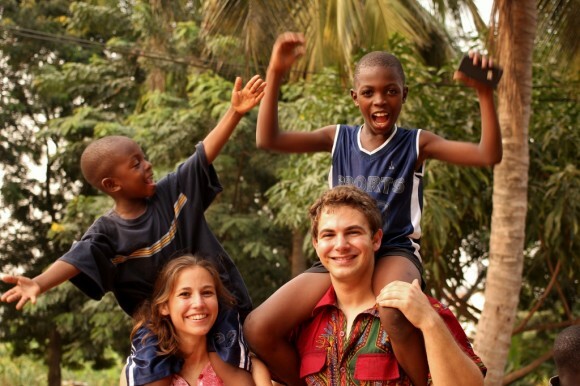 However, after talking with Janet, I began to realize that parents in Ghana don’t see the primary and secondary costs of getting treatment as sacrifices. They see it as investments. Janet described in detail the ramifications of neglected clubfoot. She outlined the doomed path of disability in this country, which would ultimately inhibit Phillipier’s ability to go to school and maintain a labor-intensive job when she is older. Janet told me about how she herself used to have a food stand, but she couldn’t maintain it because of the cost of transportation in terms of money and time. With clinic visits happening weekly, she had trouble bringing in enough profit to maintain the business, and it eventually went under. But to Janet, the sacrifices are all worth it, becuase when she sees her child walk, she knows she will have a bright future. By the end of the dinner, I guess DJ Steve had done his job well. He had me, Zach, and all of the waitresses cracking up. He sent us home happy, but gave us his phone number just in case we were ever sad. I am not kidding. Our week in Sunyani began with a day of filming that touched and inspired both Hannah and myself. We began by heading about forty minutes from Sunyani to Techiman, where we arrived at the Holy Family Hospital and sat briefly with administrators, who, after a quick prayer over our project and a bit of an explanation of our mission, graciously offered us transportation for the day to take us into the more remote areas in which we’d be shooting. Seeing that our vehicle for the day was a pickup truck, Oti and I wasted no time in heading for the back and propping my camera up against the bag. We’d continue to joke around and take shaky photos down the bumpy road until we arrived at the home of our first host. After a cool sachet of water (fresh water is drunk out of plastic cubes, much like small air bags used in domestic shipping), we were back in the pickup truck and headed to an area that was a bit more off-the-grid. We arrived in what felt like a desert (though I’ve since become more acclimated to the heat), our faces covered in a thin film of dirt and sweat. We lugged our bag out of the back and set up shop. We were scheduled to meet with the mother of Mubarak, a little boy who was very nervous about our appearance. We’ve become very used to the look that children often give Hannah and myself. It’s a blend of “I don’t like this new white-skinned thing in front of me,” and “what are you?” Many Ghanaian children haven’t seen non-Africans before, and we’ve found that while older children are delighted by seeing us ‘obruni,’ or white people, infants and toddlers are usually absolutely stunned – and often terrified. Mubarak is solidly in the latter camp. He was suspicious of our arrival at his home and gave me a wary look the entire time we were there. Being slightly more tan than I am, Hannah sometimes gets a pass from little kids. I never do. I am perpetually a ghost or a clown from another world, depending on the child. We gave Mubarak a little green bracelet (which he cautiously took) and I made him a little band out of paracord that I fitted to his wrist. He lightened up slightly, but he remained attentive of our every movement, as if to keep an eye on us. Mubarak’s mother, a quiet woman who seemed somewhat similarly cautious about our arrival, told us that she knew of a mother nearby whose child, now grown, might have had untreated clubfoot. As this is the closest we’d come to a case of untreated clubfoot, we tried to hide our excitement and calmly asked if we might have her contact information. We continued preparing for our interview. Hannah had noticed, though I was unaware, that a child had been dispatched from the house with the mission of finding this mother and escorting her back to our set. 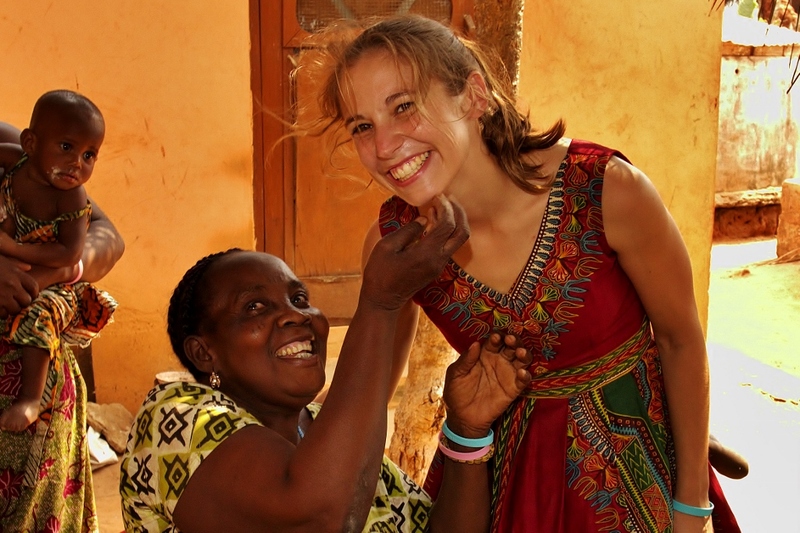 She let me know and we shared a moment of nervous laughter: when we actually sat down with a woman whose child had grown up with untreated clubfoot, would we really be able to remember the questions we’d been dying to have answered? Would we be able to keep our composure? How would we tell her, as we have with every other patient, that I was also born with clubfoot? My mind was racing and I began to set up the tripod for our shoot. In a moment that I will never forget, I used my knife to screw a baseplate onto my camera. As I twisted the blade, I stopped to wipe the pool of sweat that was accumulating in every corner of my face. The heat, sweat, and a dust combination was unbearable. The sun was bright and I could barely see the road that led into the main village. But I saw someone approaching. At first, I noticed a tall man in traditional Muslim garb. He walked slowly and deliberately. I noticed a severe limp, and, for a split second, thought to look at his feet. I couldn’t see much from my distance away and I made a note to myself that I was thinking about clubfoot too much – I seemed to be projecting it onto everyone with a limp! As he approached, though, I could see, finally, that he walked on the inner and upper part of his foot. It looked as if his foot had been literally flipped over and walked-on like a shoe. Shaking, I put the tripod down and walked over to Hannah. I don’t remember what I said, if anything. I just remember pointing with my eyes and seeing her freeze, just as I had. She looked at me and we were both silent for a moment. After nearly two months of searching for an untreated case of clubfoot, asking every doctor we encountered and practically begging villages to connect us to these individuals (often so marginalized that they’ve been cast out by the community), this young man was slowly and casually making his way towards our set. Twenty-three years ago, two boys were born. One was born in Techiman, Ghana. One was born in Charlotte, North Carolina. They shared a common condition: they both had bilateral clubfoot. And they shared a common name: Zachary. On this day, across this hot, dusty plateau, they would meet for the first time. Razak, or “Zak,” is named after his father, Zachariah. He’s my age, shares my name, and hobbles over to me and extends his hand. “You are welcome,” he says. I am paralyzed. I sit Razak in an outdoor area with a series of walls without roofing, where we can get adequate light for our shot and maintain a basic level of privacy. I clear the area. Oti readies himself for what will surely be an emotional translation and Jerry sits in the doorway and keeps our atmosphere undisturbed. Hannah and I wire Razak up and begin our interview. I know it must be difficult to speak on-camera with such a debilitating condition. I thank him for his bravery. He smiles. I ask him if he’s in pain. He says no. We talk about his life. I ask about his future. He asks about my feet. I ask him about the differences between his clubfoot and his unafflicted foot. He seems confused. 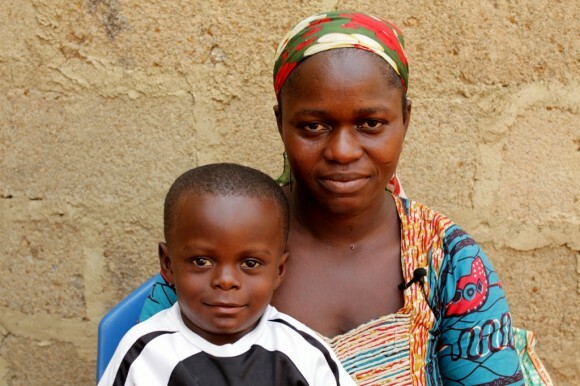 Razak’s mother, to her credit, brought her child to the local clinic the moment she realized her son had a deformity. In both feet. He was fitted with two large metal braces that ran all the way up his leg, near the hip. While the left brace functioned properly, correcting the foot’s deformity, the right brace broke. The family couldn’t afford a replacement. 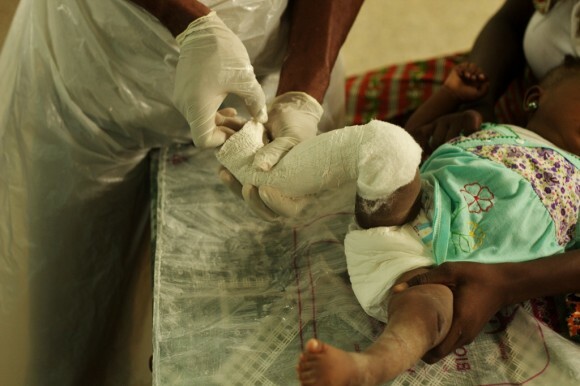 Razak walks, slowly, with both a corrected and an untreated clubfoot. He gets angry sometimes, he says, and he sits in his room alone. He sometimes wonders why he is so different. He feels cheated. Every day he is humiliated by his peers. He’s dropped out of school. He says that everyone stares, many people ask, and some simply judge. Other times, though, he feels lucky. He sees people worse off than himself. He can still work: he drives a taxi cab and, despite being given a hard time in earning his license, earns an income that helps support his family. He is a contributing member of society. When people stare, ask, or judge, he tells them that they are looking at God’s creation, something special in its own way. The open wound on his right foot isn’t a sore created by irritation as he walks along the road; it’s the result of a mishap with a motorbike. And there we stood, Razak and I leaning against a wall and joking for a few minutes as Mubarak looked on – still quite anxious about my presence. We were a trio that consisted of treatment, surgery, and neglect. I had met someone with my name, my age, my gender, and my condition. And we were so similar, yet so very different. Hannah and I had finally encountered the untreated patient for whom we’d spent so long searching – and he rides a damn motorcycle. The sound of his engines against the wind as he races through clouds of dust – it must be the sound of defiance. After a day that had rattled us, we ended with a meal of omotuo and ground nut soup – how else? We hitched a ride back to our hotel in the pickup truck and passed out. It had been a long day. Tuesday morning (Jan. 14) was an early one. We arrived at the Holy Family Hospital in Techiman and set up our equipment: today would be our first time filming a Ghanaian clubfoot clinic. We were greeted by Isaac, a physiotherapist in charge of his department. He guided us into a small room with church-like pews filled with about a dozen parents, all carrying their little clubfoot patients. 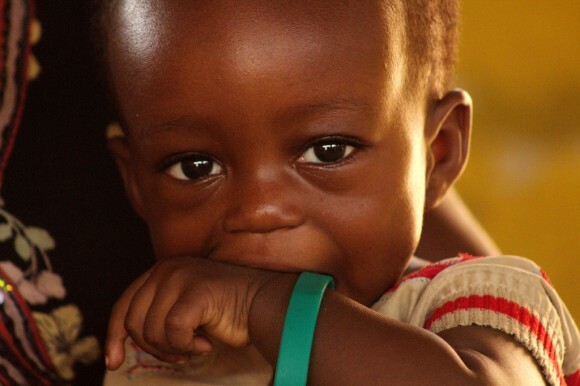 Every stage of the treatment process seemed to be represented – there were new mothers treating their infants as well as those with toddlers coming in to receive their final pairs of braces. 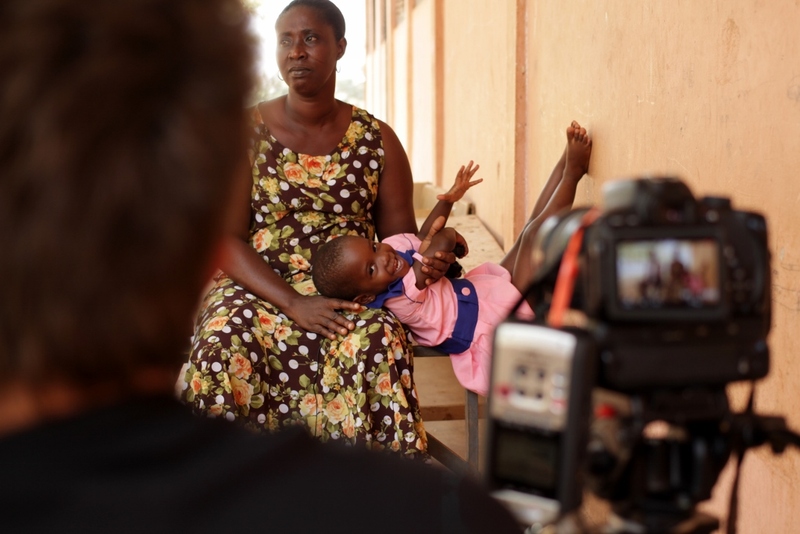 We set up quickly and began filming as the mothers congregated around us, interested in knowing about my own clubfoot treatment and handing us their children to play with and photograph. 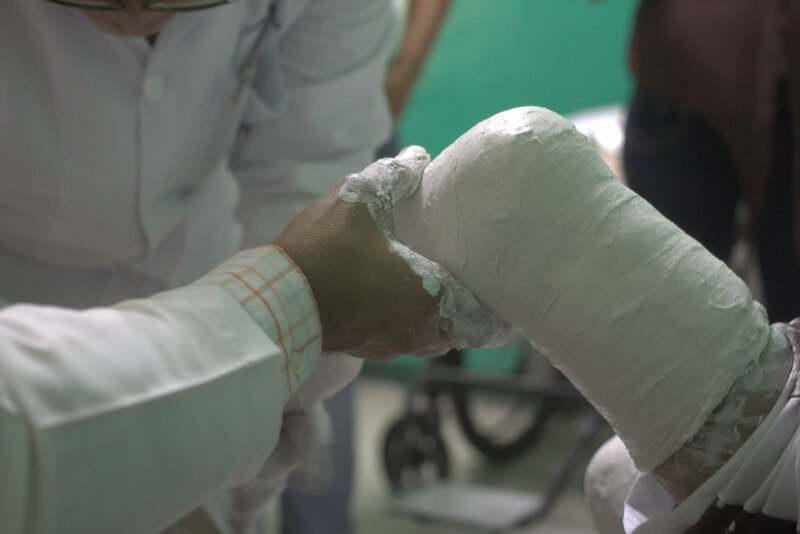 When casting began, we gravitated toward a new mother watching her child as he received his first cast. My father once described the casting and cast-removal process as “a series of crying and exhaustion – and that was just your mother!” Sure enough, the new mom had a pretty tough time watching her confused infant squirm and scream as strangers wrapped plaster around both of his feet. Truth be told, children (especially babies) often truly shriek in what appears to be intense agony as they are cast. But, as we’ve seen, it’s mostly confusion and the discomfort of being completely disoriented. The babies are often immediately quieted by seeing us (strange white faces cooing at them) and they just go on babbling happily after that. Both and Hannah and I are convinced that the only true pain experienced in the casting phase is that of older children who begin treatment later than most and have legitimately tighter muscles, more weight to bear on their feet, and more complicated treatment schedules to make up for lost time. 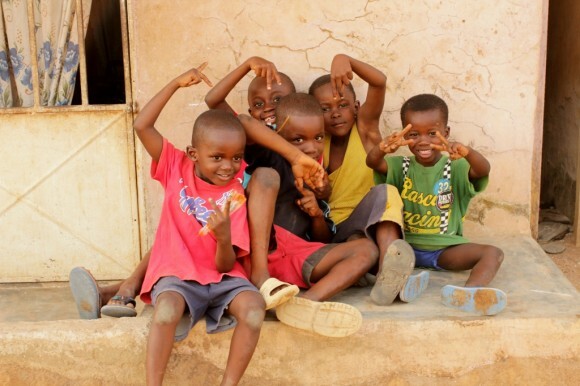 For these kids, no cooing from us is going to make that feel any better. The new mother sat against an operating table adjacent to the casting area where her child screamed and groped the air, arms outstretched, as if to pull into himself any reprieve from his situation. While she couldn’t, at first, stand to watch the casting, she slowly made her way to the table. As if by magnetic pull, as soon as she came within arms length of her child, she was in full-blown consolation mode. She held her child’s head against hers and sang softly into his ear. She wiped his face, then her own, and it was hard to tell their tears apart. I tried to encourage her, with Oti’s translation, but I realized very quickly that words wouldn’t do. I leaned against the table next to her and we sat in a stunned silence. It’s moments like these when I really feel a deep respect for the parents willing to put their child through what is often a scary situation for everyone involved – all on the hope that it will spare them a life marked by disability. 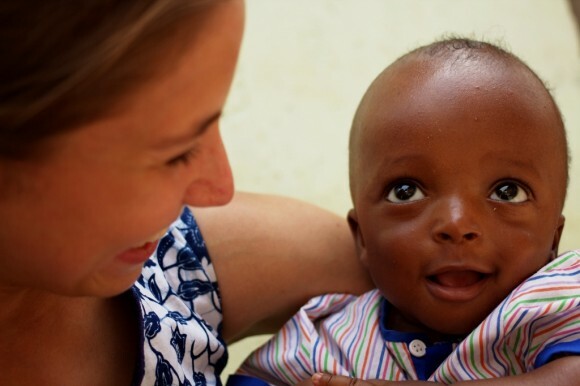 After we regained our composure, and the new mom whisked her child swiftly out of the clinic for a nap and lots of cuddling, we sat down with Isaac, who told us about his role at the clinic and the value of the counselors. Out of everywhere we’ve been, we’re often asking doctors and patients about the social support that’s provided by the healthcare system. 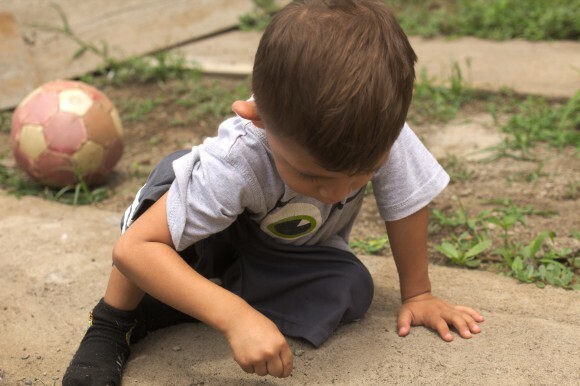 While the child’s feet will be treated well in each place, we are often met with confusion when we ask what systems are in place to ensure the emotional health and psychological stability of the mother and family. 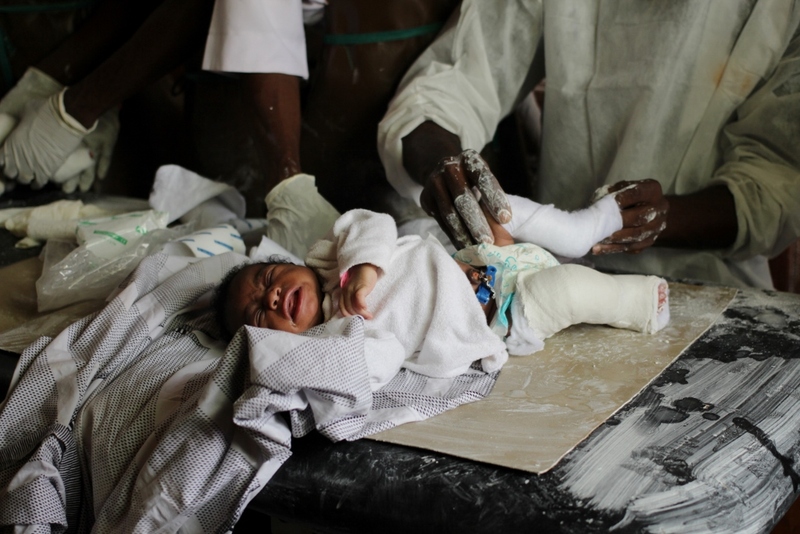 In Ghana, as we found in Vietnam, many people see clubfoot and blame the parents (particularly the mother), the family, or assume that it’s a curse or a judgement from an angry deity. Often, husbands in every country we’ve visited will leave their wives – refusing to acknowledge their child and his or her disability. In Ghana, every clinic provides counselors with the sole mission of keeping a watchful eye on the well-being of the families in treatment for clubfoot. They are all volunteers and only receive slight stipends for transportation costs. They seem to care greatly about the children, their parents and the community as a whole. Many are religious leaders, adding to their effectiveness in an extremely religious society. On a darker note, though, Isaac spoke to us about one of the most crucial functions of the counselors: preventing abandonment or “disposal” of children believed to be the product of an evil curse or witchcraft. He claimed that in some small villages, the children simply disappear or encounter gruesome deaths (such as starvation or drowning) thinly veiled as accidents. When asked just how many distinct cases in which he’s heard of this occurring, he put a confident tally at five. He did stress that this kind of abuse is a tragic, but rare, occurrence. The counselors, he said, are often the ‘first responders’ to the news that a child has clubfoot: trying to quickly reach the parents and explain that the clubfoot is natural, coincidental (and not karmic retribution), and treatable. 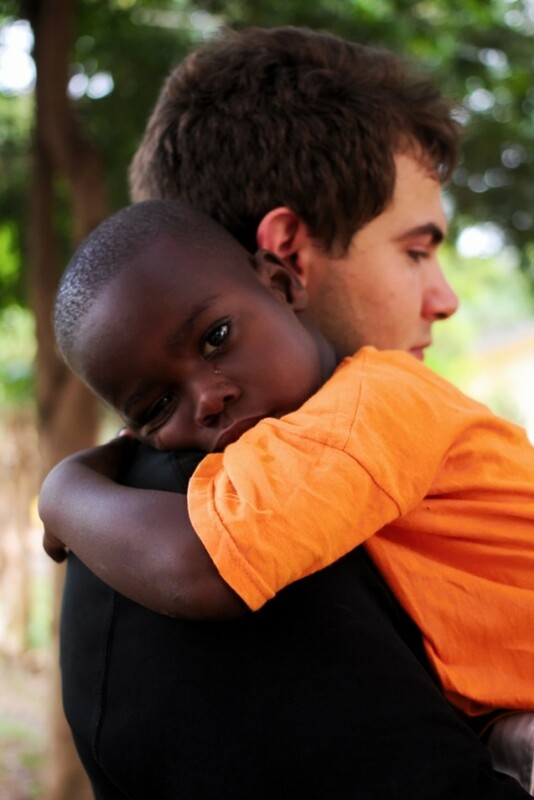 In this way, he told us, the clinics are able to save not only the childrens’ ability to walk but their lives as well. Hannah and I with Isaac. Jerry and Rev. Rockson (counselor) with Hannah and myself. After our busy day at the clinic, we headed to an early dinner (as we hadn’t yet had lunch) at Sweet Touch – one of the few established restaurants in Sunyani – and reflected on our experience with Jerry and Oti. We headed back to the hotel, where Hannah passed out immediately. Oti and I decided to get some work done downstairs – but not before Hannah sleepily asked that we get back at a reasonable hour “unless they have fresh mango. If they do, bring some back right away.” They didn’t, but after some time to just hang and enjoy the quiet of the night, we did bring her back some fresh pineapple (which she ate with only her arm and head peeking out from under her comforter). Our next day would require some serious rest. Wednesday started early, with a clubfoot clinic in the morning at St. John of God Hospital in Duayaw Nkwanta, about twenty-five minutes away from our hotel. We were excited about our primary interview: Dr. Prosper Moh, a clubfoot specialist about whom we’ve heard nothing but gracious praise from orthopedic surgeons across the globe. His reputation is that of a passionate man out to eradicate clubfoot with his own two hands. We were, however, in for a very different morning. We would have our interview with Dr. Moh, but not before we filmed some casting and bracing. The highlight of this, of course, would be the five year old patient (who began his treatment at a very difficult age) cursing at the technicians as his mother restrained him during the casting process. At one point, though, he cried out and pointed at them all – to which they returned peals of laughter. As it was translated to me, he had accused them all of being traitors and had called them ‘human toilets,’ describing in detail how he might use said toilets. What was most surprising, though, was the bracing room. After the patients were given their braces, they had been asked to stay and listen to an educational speech with a white man from the United States. As the white man in quetion, I was not informed of this. When we arrived in the enormous rehabilitation room, we found seated rows of mothers, fathers, children (many in braces or casts), and physicians. In front of these forty-six clubfoot patients and their families, I was asked to sit in a chair as I was introduced for nearly twenty minutes. I would follow two other clubfoot mothers who spoke to the crowd, giving tips and suggestions to the new mothers in the program. As it was explained to me, these groups regularly meet for peer education, but not nearly with this many parents in one session. No pressure, right? Oti sat close by and Hannah set up our wide-angle lens to capture the exchange. On the fly, I had to come up with something to tell these people – and make their wait worthwile. I described my own experience, joked about my own abilities and inabilities, stressed to them that their children – all receiving the Ponseti method – would be much more mobile than I have been. When I told them that I was jealous of the treatment their children were getting, I was greeted with smiles and bright eyes. I fielded questions, referring medical questions to the physicians in the room, and took off my shoes and socks, jumping and walking around the room at the request of a mother in the crowd. Near the end of my presentation, I was joined by Dr. Moh himself, who used my case to illustrate the progress that’s been made in clubfoot treatment since my own experience. There’s no question that I was given the best possible treatment offered in my part of the country, but most of the children in this small town in the developing world won’t have a fraction of the discomfort I feel due to our shared deformity. Some parents stayed after the presentation to ask questions and get pictures with us, and I hope that the session was as meaningful to the participants as it was for me: I’ve never had the opportunity to directly address so many people on the topic of my clubfoot experience and I found it to be incredibly therapeutic. Hannah, Jerry, Oti, and I headed out to a quick lunch before rushing back to the clinic and sitting down with Dr. Moh, who delivered on his reputation of being well-spoken, passionate, and sincere. He spoke with us about the need for clubfoot awareness and early intervention. I asked him a tough question: when there are so many common lethal illnesses and conditions that exist in the world, why focus on a condition that isn’t deadly or more common? He paused, then answered slowly and deliberately. “It’s about the window of opportunity.” Illnesses are often long and protracted, he said, and treatment isn’t guaranteed even with the best care. With clubfoot, though, there’s a distinct window of opportunity for children in which the treatment will, in almost all cases, be successful. 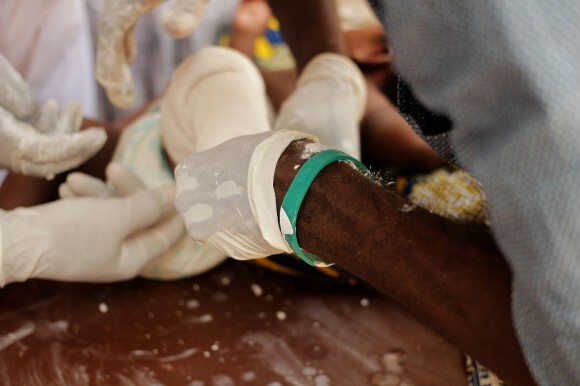 “When my neighbor goes to bed hungry, I can’t sleep,” he said, “and eradicating clubfoot is giving a child the rest of his life back. I can sleep doing this.” He beamed as he told us of his vacations from the hospital, in which he literally packs up his car with medical instruments and drives to remote areas on the lookout for untreated clubfoot. “It’s my hobby,” he admits, “I just love treating clubfoot.” In all, Dr. Moh gave us a fantastic interview and we were honored to meet him. 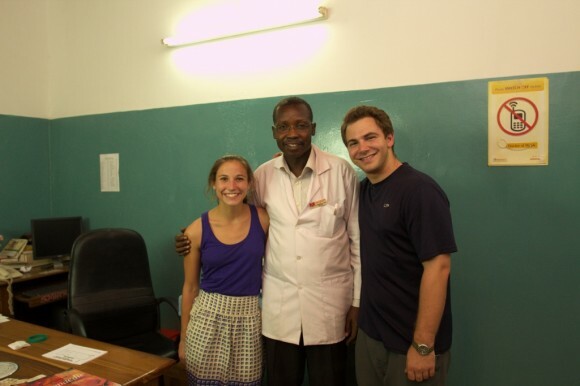 Hannah and I with Dr. Moh. The following morning (Jan. 16) we were, yet again, back on the road to visit patients in their homes. We began with a tumultous interview in the commericial area of Sunyani. 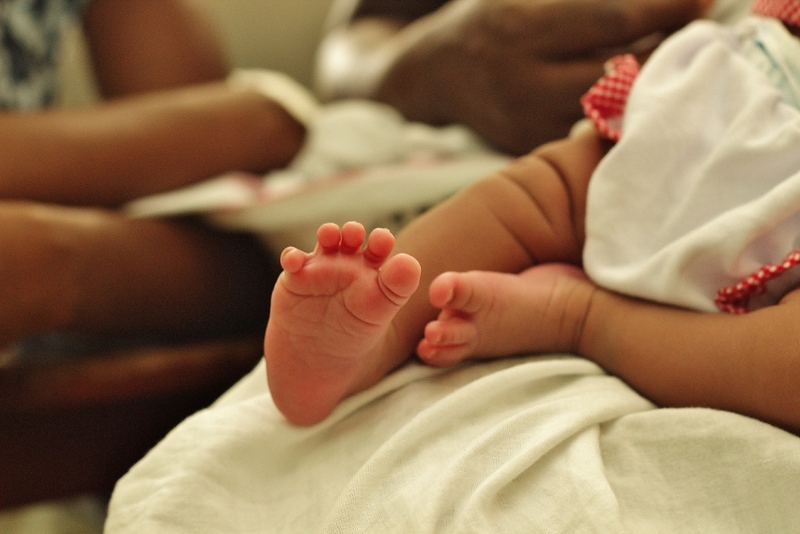 While we interviewed the mother of a little girl with multiple health conditions, clubfoot being just one, we faced issues of noise, of vague answers and a generally problematic setup. However, we did catch one moment of emotion that took us by surprise. “When my child was born, I saw that she had this problem with her feet and I just wished that she had died,” the mother said, shocking our team. She now regrets that statement, she softly noted. “Thinking those thoughts is one of my biggest regrets because, looking at her walk now, I am so happy to have her.” Just as soon as this emotional door was opened, it was promptly closed, and we struggled to get her to open up again. Our next interview was in the home of Justice and Joyce, a forester and a beautician. They are a little more financially secure than some of the people we’ve interviewed and it’s clear that they’ve spared no effort in ensuring their child is treated adequately. As Hannah, Oti, and Jerry took on the difficult task of keeping the child happy, calm, and quiet outside, I asked Justice about his relationship with his firstborn daughter, over whom he is clearly protective. “Well, I wanted a girl from the beginning and I just felt like I won the jackpot,” he said, his face lighting up. 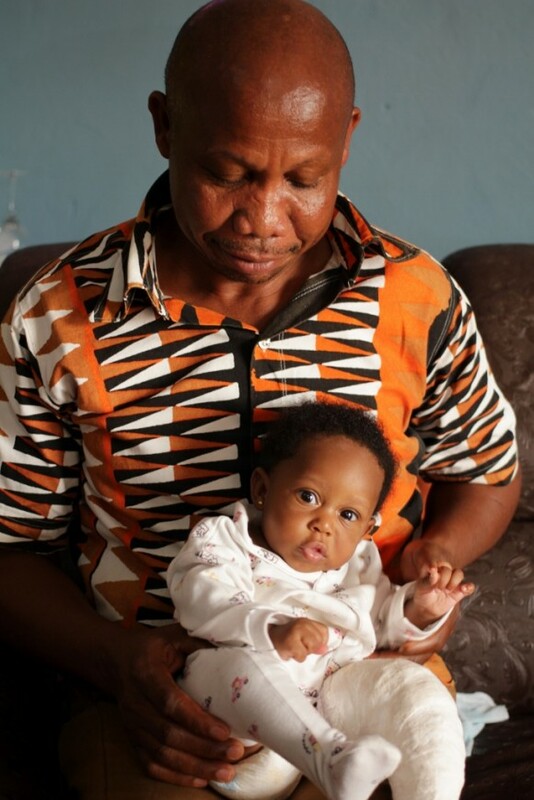 “When we saw the condition, I knew about clubfoot and that it was treatable. I also knew, though, that even if there hadn’t been a treatment I wouldn’t stop until there was one for my daughter.” Joyce, who doesn’t speak much English, asked her husband to translate her sentiments. 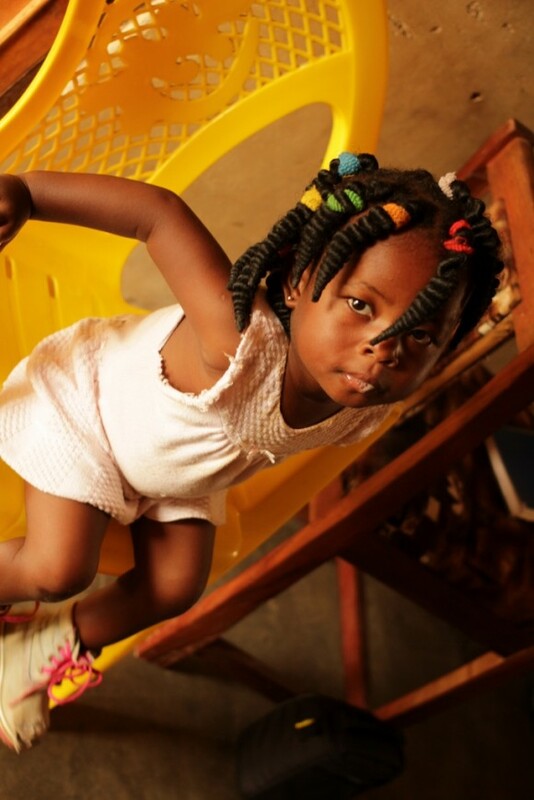 “Clubfoot or not, having my daughter was the happiest day of my life,” she said. On the road again, we made our final stop at a schoolyard outside of town. Bustling with students and teachers alike, we stuck out like sore (white) thumbs and we turned playing in the yard into a spectator sport. We sat with three-year-old Selena and her family on benches outside a classroom building and as we asked questions to yet another set of caring parents, Hannah played a silent game of peek-a-boo with Selena. While Selena kept her distance and played it cool during our time with the family, as Hannah began to leave after our goodbyes, Selena began to sob. Hannah returned for one more hug, during which the crying ceased immediately – only to resume again as our taxi drove off. The end of our filming in Sunyani meant Oti’s return to Dodowa. 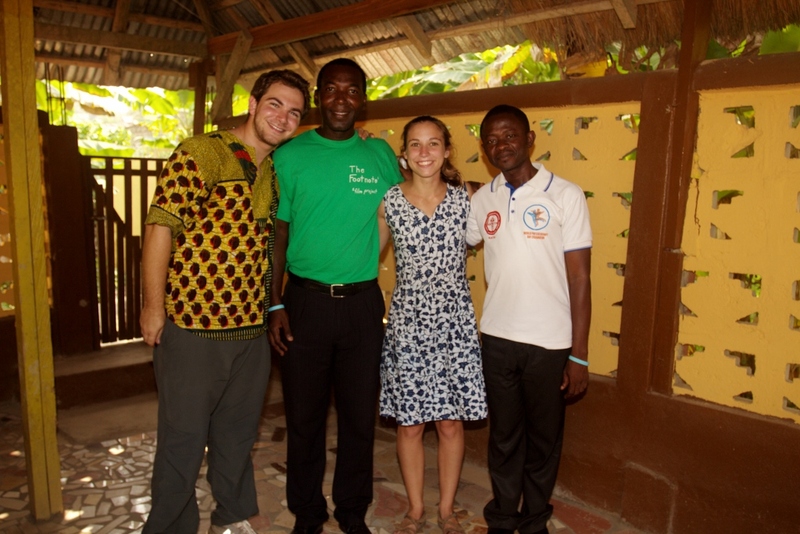 We said a tough goodbye (though we would see him again in a week) and he headed in the direction of Accra. 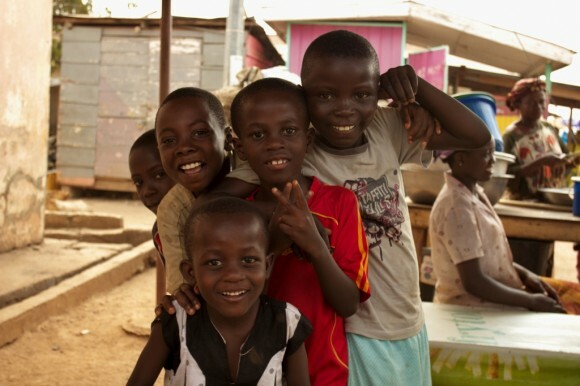 We packed up our bags and prepared for our trip to Kumasi, where we would spend the weekend and the following week. Last Friday morning (January 10), Zach and I woke up bright and early to catch a domestic flight to Sunyani. 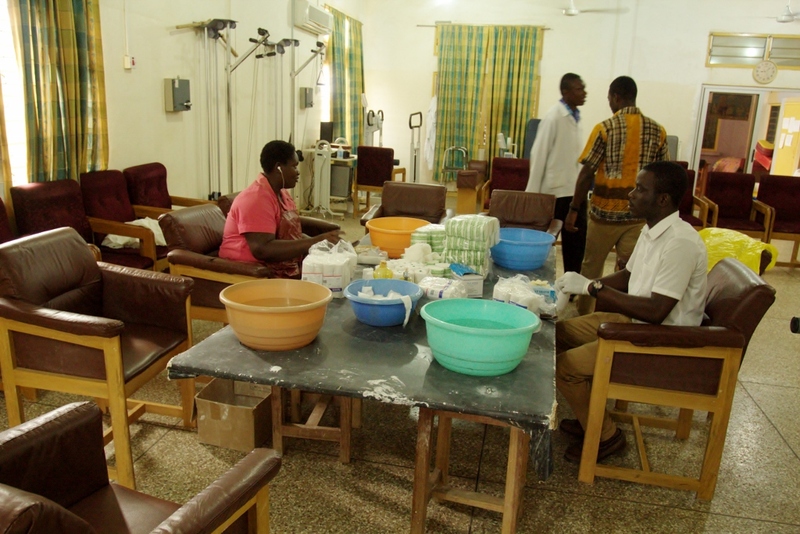 Sunyani is located in the mid-western part of Ghana and is very close to the Ghana National Clubfoot Program main office. Our small propeller plane landed safely at the smallest airport to which I’ve ever been. Soon after, we met Jerry Barnes, the Country Program Coordinator for CURE International. CURE is a charity that operates out of the US and focuses on disabled children. 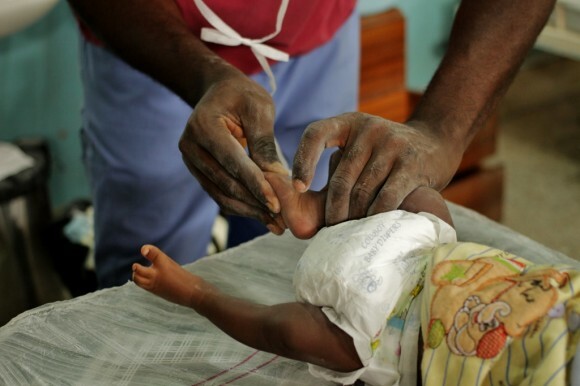 However, one of their largest global efforts is increasing the access of clubfoot treatment. They work in multiple countries in Africa alone. 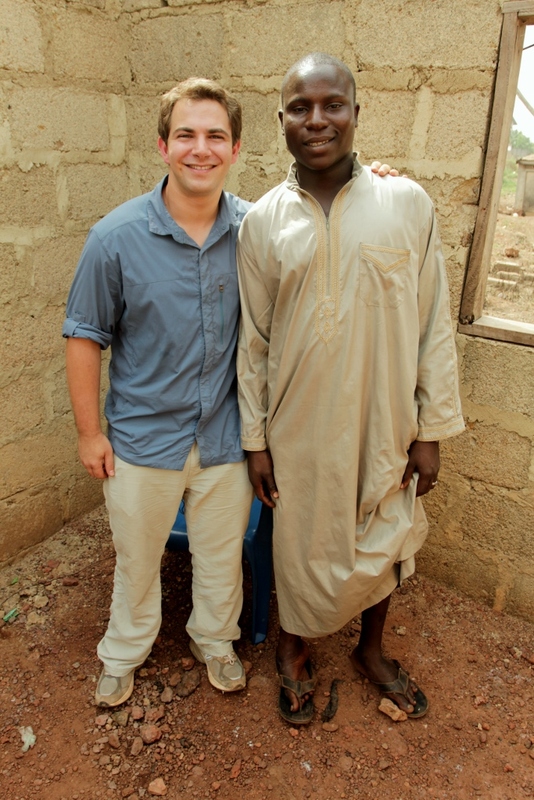 Zach and I were excited to finally learn more about the clubfoot initiative in Ghana. Jerry and Rose are opposites. While both have extremely big hearts, Jerry is very gentle, soft-spoken, and above all, tall. Although their personalities and stature may differ, I know that both have put their full effort into making sure we get the footage we need for our documentary. We are so grateful. Jerry brought us to our hotel where we discussed the weeks ahead. 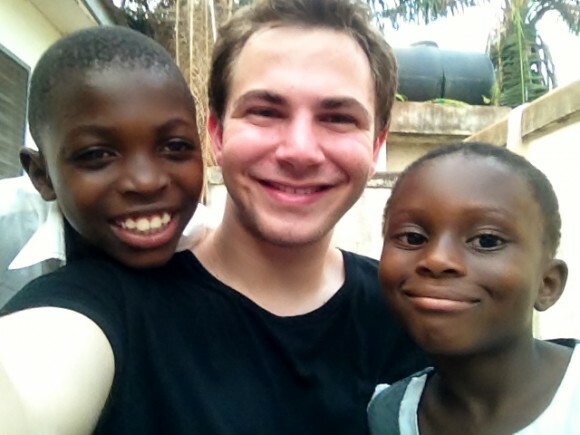 We talked logistics, and Jerry gave us some basic details on the Ghana program. There is one aspect of the clubfoot initiative which we haven’t seen in any other country so far. Jerry told us that at each clinic, there is at least one counselor who gets to know each and every patient and their families. 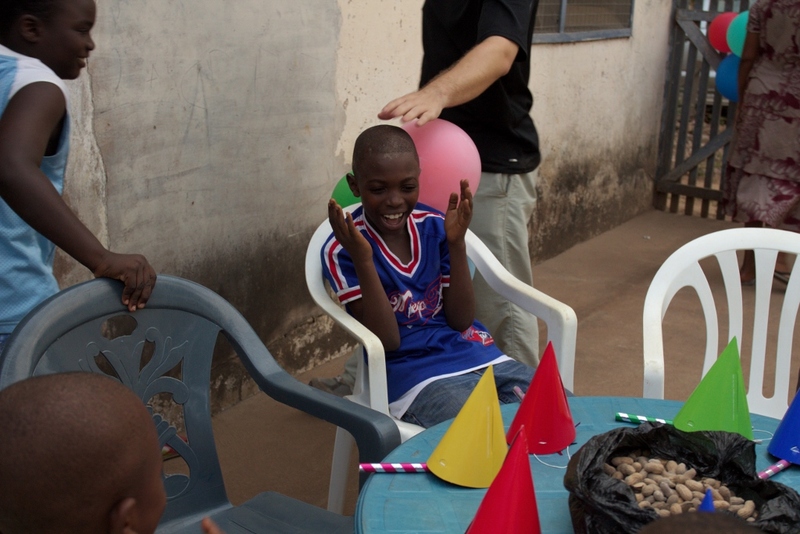 The counselors are there to give families social support while going through the treatment process. At every appointment, the counselor will sit down with each family individually and encourage them to comply fully with treatment. Being that CURE is a faith based organization, the counselors are often a pastor or a reverend. At home, some might see this as problematic. But in Ghana, where religion and every day life are inseparable and there are probably as many preachers as there are goats, this additional social support definitely doesn’t seem to be negative. After talking with Jerry, the three of us headed to lunch in downtown Sunyani. Sunyani is definitely a very small city. The main downtown has an area of no more than six blocks. With that said, it is densely populated. At some point in time, there were sidewalks. I guess along the way, sidewalk also meant “paved, flat area, perfect for my stand.” People sell anything from used sneakers to live chickens right in these stands. Walking through Sunyani, we wove through all of the different vendors to avoid having our toes rolled over by the multitudes of taxis on the street. Jerry led us to a second story restaurant called “Sweet Touch.” There, all three of us enjoyed a delicious bowl of groundnut (peanut) soup and omotuo (sticky rice balls). This happens to be one of my very favorite Ghanaian dishes. For me, it is the epitomy of comfort food. It always leaves you incredibly full and sleepy, but not overly stuffed. So its comes to no surprise, that after lunch, Zach and I headed back to the hotel to catch up on some much needed rest. 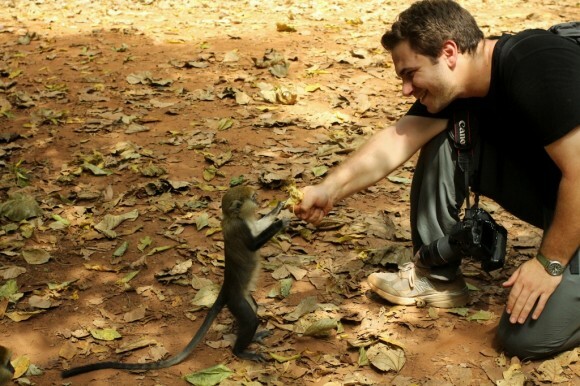 The next day Zach and I headed back to Sunyani to explore on our own. We walked through the market and up and down the streets. Finally, we decided we were hungry, however we had ended up in a residential area. We walked through the little communities, attracting some attention. We were struggling to find anything remotely resembling a restaurant when I spotted a stand that just said ‘Special Rice.’ “Perfect,” I thought, “just the type of thing we are looking for.” Behind the stand, there were some stools and tables underneath a tarp. Zach went to go find us a place to sit, while I attempted to order whatever they were serving. The ladies running the stand spoke almost no English, but after pointing to the rice and a bowl, I successfully got some food for us. We sat down to enjoy our meal of white rice and black eyed peas with some mystery red sauce mixed in. The second we sat down, a gang of children came over. They had spotted Zach’s camera from a mile away, and wanted their pictures taken. Immediately, Zach seized the moment, and whipped out his camera. The kids tackled each other, posed with smiles, posed with silly faces, jumped, ran, and climbed. They did whatever they could to make sure they were in at least a few shots. Zach took some great pictures before the ladies at the stand chased the children away. But nothing could really keep the kids away. After we finished our food, the gang followed us far away from their homes, back to the middle of Sunyani. We were utterly impressed at their determination. We ended up finding an internet cafe (with incredibly slow internet) and walked inside. The kids told us that they would wait outside, but by the time we left, I guess they had finally given up, because they were no where to be seen. After taking a few more shots of the city, Zach and I headed back to our hotel for the evening. Sunday was a great day. We woke up early, ate breakfast, and then headed out for Fiema – a very special place for people like me, who love primates. 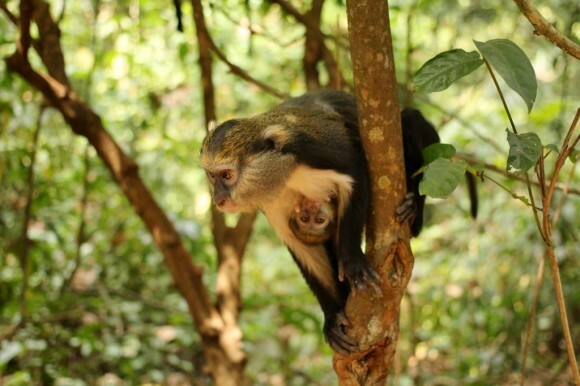 Although a very small village, Fiema has a large population of Mona Monkeys as well as Colobus Monkeys. Zach and I took a series of taxis to get to there, and after a couple hours of driving, we were dropped off at an unassuming house. Immediately we were greeted by a man named Joseph who took us into the house (which actually turned out to be the visitor center) while we waited for our guide. Soon, our guide, Isaac, picked us up, and took us to a vendor selling bananas. Then we headed into the forest. It wasn’t long until we saw one of our monkey friends. Isaac called the monkeys by making a high pitched kissing sound. Before we knew it, we were surrounded. 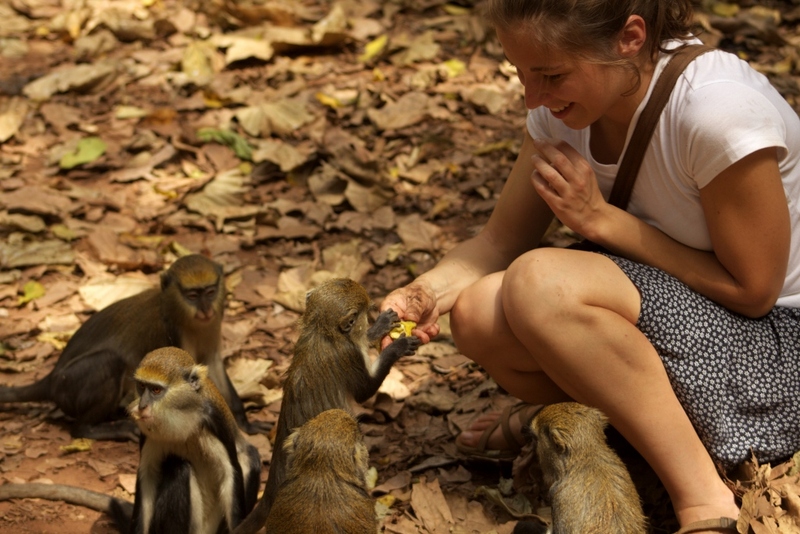 We walked through the forest, feeding the little Mona monkeys bananas. We even spotted the larger Colobus monkeys high in the trees, however they aren’t nearly as social. The town considers the monkeys to be sacred. 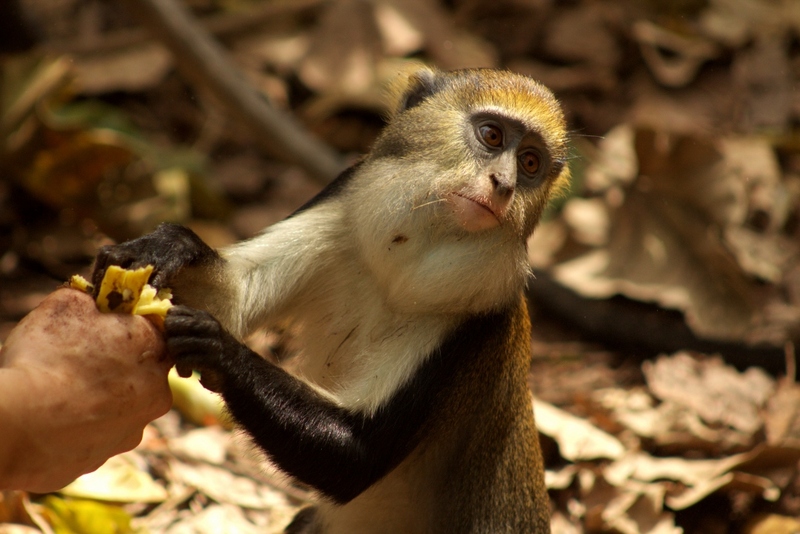 Isaac told us that in the morning and evening, the monkeys will come into the village and eat with the people. They will take food right from bowls. 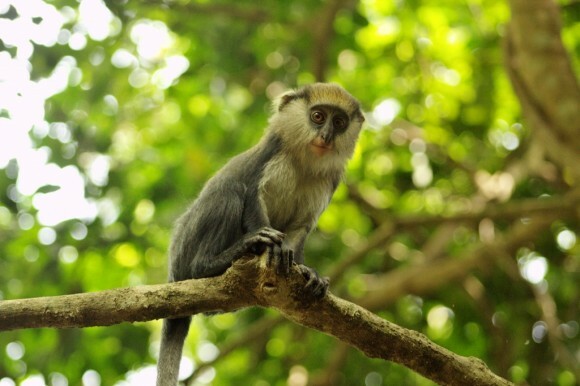 The village is determined to preserve the monkeys, and even has a special cemetery when someone finds a monkey who has died. We ran out of bananas very quickly, so we headed back into the village to buy some more. Another group of two Ghanaian women had arrived to see the monkeys, and we were told that they were our only chance of getting back into town, since taxis are very rare in Fiema. Luckily, this gave us more time to spend with the monkeys. 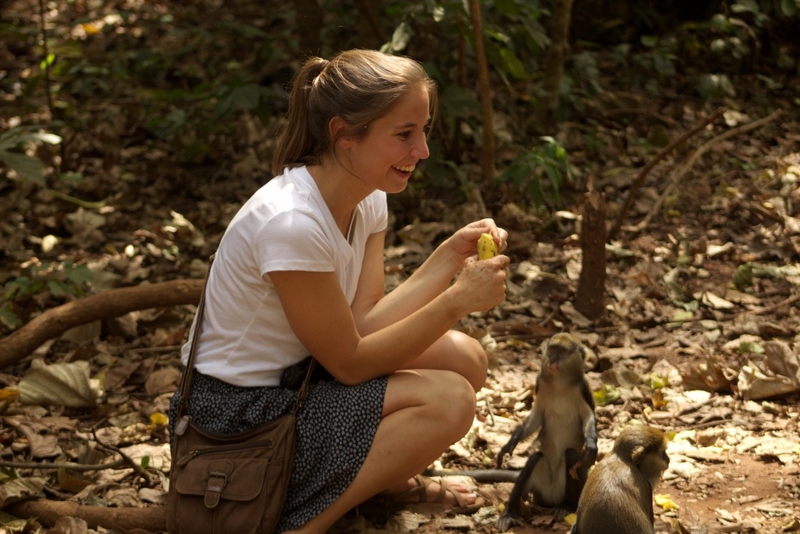 So I sat on a tree root on the forest floor while monkeys crowded around me, hoping I would give them some banana. I was in heaven. Zach had a great time getting some “National Geographic” photos while I continued to distribute my remaining bananas. I ran out of food right when the other Ghanaian women finished their tour. We hopped in their car, and rode back to the closest taxi station (still about 30 minutes away). We were so grateful they had showed up, otherwise, who knows? We might still be in Fiema. Of course, I don’t think I would complain about that, but it surely would inhibit our ability to make a documentary about clubfoot. 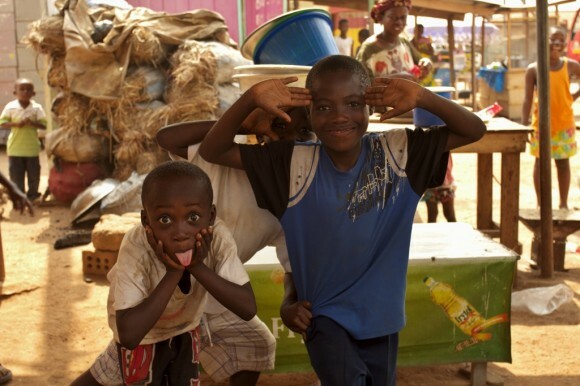 We arrived back in Sunyani late in the afternoon, and shortly after, Oti arrived from Dodowa. He was to be our translator for that week, and we were so glad to have him. Because of Oti’s research work, he often has to translate from Twi to English. I knew he would be a great person to have on our trip for this purpose alone, but of course I was excited to spend time with my buddy. We all ate dinner together that night, and went to bed early. Monday morning marked our first day of filming, and Zach and I wanted to make sure we were organized and rested before heading out. Well, Hannah spared me the “I told you so,” moment and allowed me to be proven wrong gracefully. The truth is that Ghana is phenomenal in so many ways and, I can attest, it’s not the Africa you’ve been warned about. It’s not the starving child who (“for just cents a day”) you’ve been asked to save and it’s not a country wrought with war or civil unrest. It’s a peaceful, relaxed, and open nation that has truly impressed me. As we walked through the airport, we were greeted by countless Ghanaians, telling us “Akwaaba to Ghana!” Hannah let me know that Akwaaba means “welcome” in Twi, the most universally spoken native language in Ghana. As soon as we entered the airport in Accra, a small man standing excitedly close to the baggage claim lit up. His face broadened into a maniacal smile and his eyes began to glow as he raced over and, to my surprise, lifted Hannah straight off the ground in a spinning hug. Peals of laughter and gleeful cooing came from the giggling ball of Hannah and Oti, a dear friend, and it was hard to tell from whom exactly it was coming. After Hannah’s reunion with Oti, it was time to for me to meet for the first time the person who kept an eye on Hannah while she was in Ghana during her studies in Dodowa and recently warned me (over Skype) to “keep an eye on my sister.” He came in for a big hug and we were instant buddies. We headed out for our second reunion of the day. 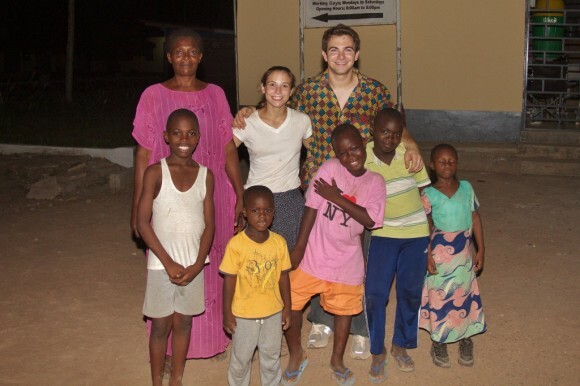 During Hannah’s time in Ghana last year, she lived in a guest house operated by the research center in which she worked. But everyone’s got to eat – and Hannah had quite the arrangment. She ate most of her meals with a family in Dodowa, where we were headed next. 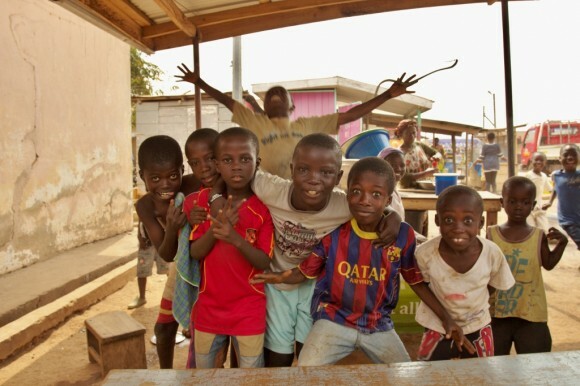 Charity, the woman responsible for Hannah’s love of Ghanaian food, has a huge family filled with energetic children – all of whom love Hannah. We pulled up to a school and attracted quite a bit of attention. White people, called ‘obruni,’ are a rare sight and werever we go we can hear the word whispered, spoken, and shouted. People are genuinely excited to see us simply because we’re so different. 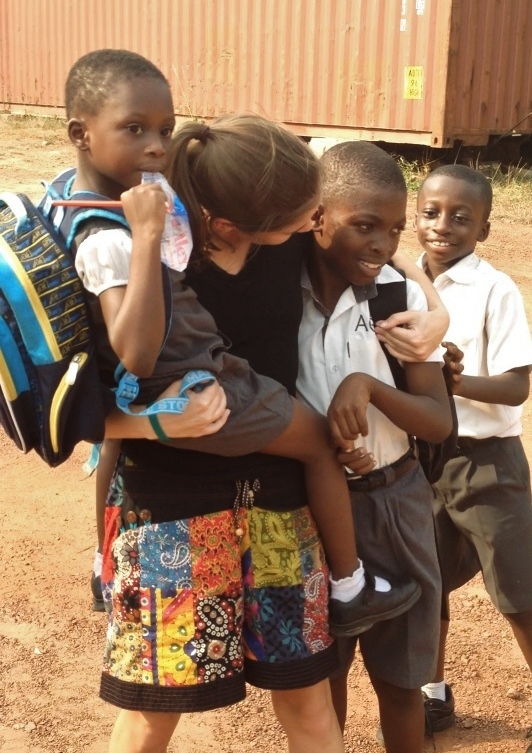 School children are attracted to Hannah like little magnets. We were soon surrounded. Hannah, however, had her sights set on a few children in particular: Emma (pronounced “Eema” and short for Emmanuel), Elvis, and Gina, all of whom Hannah had grown close with through her relationship with Charity. Lovelyn, one of Charity’s daughters, and one of Hannah’s closest buddies in Ghana, was also at there at the school to meet us. Hannah quickly found herself with quite the handful as the three children thrust themselves at her like little missiles of joy – all the while shouting “Hannah Banana!” at the top of their lungs. Hannah was in heaven. I made my own introduction, but I was told the children might have to warm up to me first. Gina, Hannah, Emma, and Emma’s classmate at their school. Well, that didn’t take long. Both of my hands were soon grabbed by various children as I was led away from Hannah (who was meeting with school officials) to the playground. A new game had started: see how many children Zach can physically hold on his back before he collapses. I think I maxed out at four or five. As soon as one child would slide off of my shoulders, another would leap onto my back and shout, “Run, obruni, run!” and I would soon be racing against a small boy or girl (who wasn’t carrying anyone) that would scream excitedly when they inevitably ran faster than I did. We picked up the children and headed back to the guest house, briefly, before heading out to meet Charity and, one of Hannah’s best friends in Ghana, Lovelyn. After more big hugs, we sat down for a dinner of egg stew with rice. My first Ghanaian meal was fantastic. Emma, Zach, and Gina at dinner. I should take a minute to explain where exactly we were based. 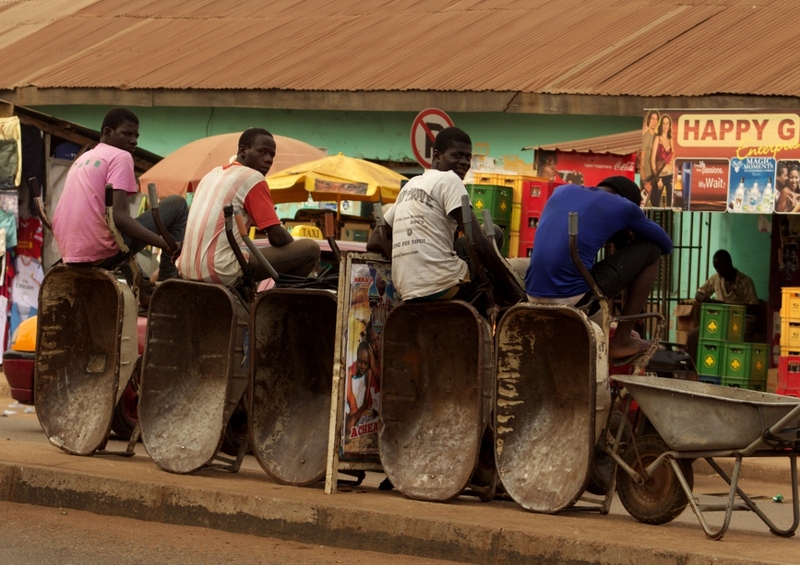 Dodowa, a bit north of Accra, is a small town that doesn’t see much tourism and is largely off the beaten path. Hannah did her study abroad work here and has a great relationship with Charity’s family, Oti, and the local research center. She lived in the same guest house in which we’d now live and she couldn’t have been happier to share that experience with me. The guest house is a nice house relative to it’s surroundings. While mud huts sit adjacent to the front gate, the guest house has tiled floors and thick screens on every window. Still, it’s best to use bed nets and, since some of the ceiling fans (there’s no air conditioning unit) were not functioning, I found myself rigging up my bed net over a small cushion on the ground on which I slept just fine. My paracord came in handy and I used zip-ties to puff out the net in the directions where more space was required. I should mention that there’s no reliable source of running water. Instead, water is saved up when the town turns on the taps and is stored in large tanks. We then bring water from those tanks into the guest house and use it to fill the toilet tanks when flushing is absolutely necessary and, of course, to take showers. Since it’s scarce, however, the best way to bathe is by taking bucket showers. I found myself weirdly appreciative of a good bucket shower. I started by using nearly an entire bucket of water for a single shower, but have since reduced my water requirements to half a bucket. You use a single, large bucket to store your clean water. You stand over a small basin and use a hand-bucket to rinse yourself off. The water that rolls off of you is collected in the basin. You use this water, now dirty, to simply get yourself wet enough to apply soap and to scrub dirt from yourself. This process continues and, at the end, you finally rinse yourself off with the clean water (quite thoroughly) and you’re good to go. After a good night’s sleep, we woke up in the early morning (as the roosters nearby don’t sleep in) and and spent the morning setting up my hammock on the porch, reading a bit, and snacking on fresh mangoes picked from the huge mango tree that sits a few feet from the guest house. We sliced open a few, put a few in the ice box for later, and I found a lime tree nearby from which I picked a few limes, sliced them into quarters, and popped them into my water bottle. 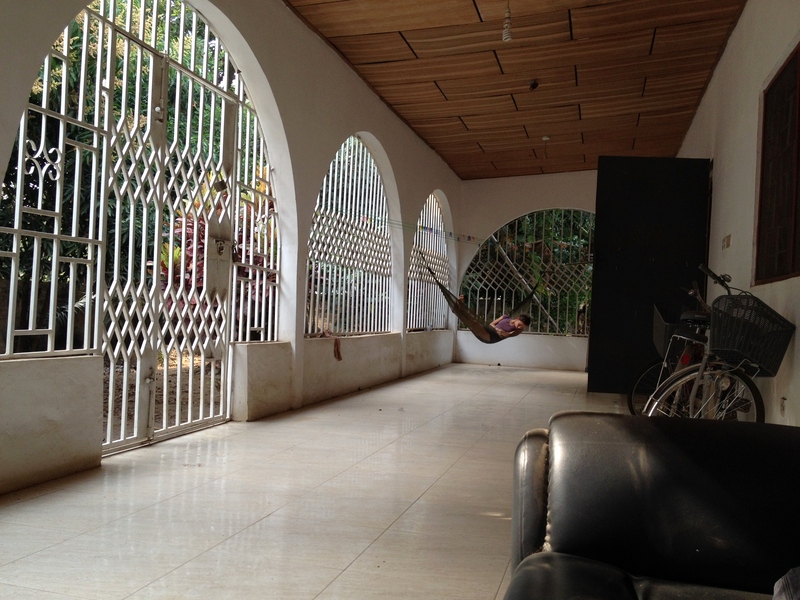 Guest house front porch with the hammock I set up. We headed to Charity’s for a delicious lunch of banku and okra stew. Banku, much like Play-Doh with a sourdough flavor, is one of a few main starches enjoyed in Ghanaian cuisine. Most of the food here is eaten with the right hand (no utensils) and the primary eating decision is which starch to enjoy. 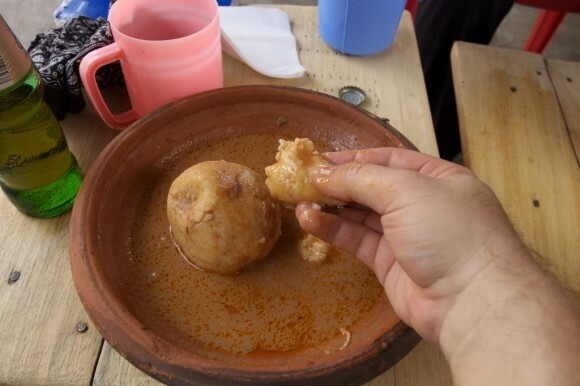 Along with banku is omotuo, a large ball of rice, and fufu, which is a soft, putty-like consistency. At a restaurant, you might order one of these starches along with a stew of fish, chicken, beef, or goat. You use your right hand to pick off a piece of your starch and dip it into the stew, soaking up the liquid and enjoying the meal slowly. Bowls of water and soap are provided before and after the meal for hand-washing. 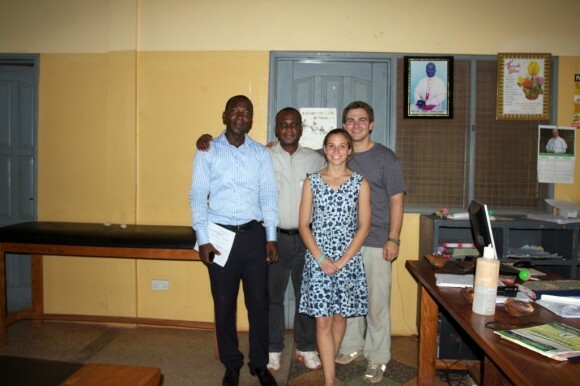 Next, it was time for me to visit the research center where Hannah worked during her time in Ghana, and where Oti currently works as a Program Coordinator. It was great to meet Hannah’s colleagues in Dodowa and they were so glad to see her again. We headed back to Charity’s, where we picked up Lovelyn and headed to Auntie Julie’s fabric shop. We bought a few yards of batik fabric and a few yards of Ghanaian wax prints. We headed to Millicent’s house near the market. Hannah is an old pro: she knows both Auntie Julie, an older woman who sells the fabric, and Millicent, a skilled seamstress, very well. 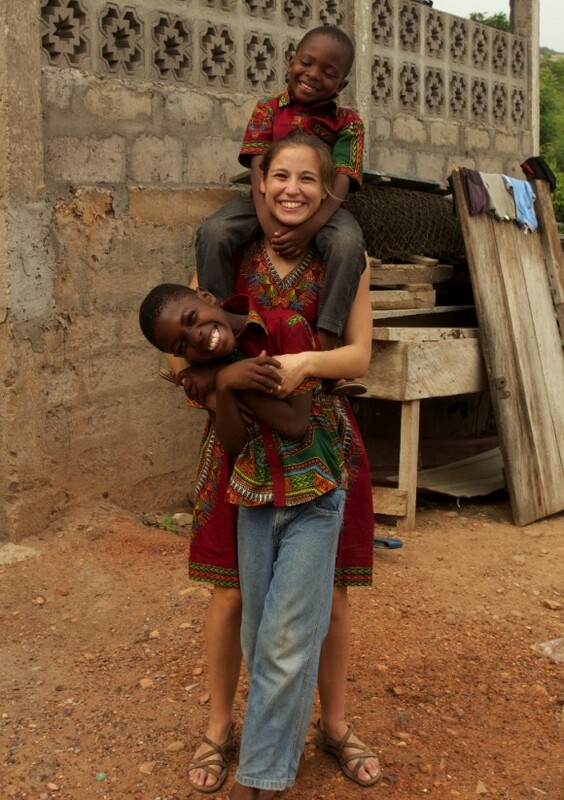 She loves having clothes custom-made in Ghana and she was excited to have me order a few shirts for myself. Millicent took my measurements and our new fabrics and we were on our way. We’re excited to pick up our new clothes when we arrive back in Dodowa soon. Dinner was one of Hannah’s favorites, ‘kele wele’, fried ripe plaintains with ginger and peanuts. It was delicious. I was able to meet Eddie, Charity’s son, who was incredibly enthusiastic about helping us find untreated clubfoot patients nearby. He spoke with us about talking to health researchers in the field who may have seen the condition during the course of their work. He also suggested that we try and film some part of a traditional medicine practice aimed at correcting clubfoot. While we’re not sure about the logistics of getting that access, we’re looking into it and it’s a great idea. The next morning, Hannah and I walked down the road and bought a few rock buns off the street. Rock buns are a sort of mixture between muffins and corn bread. Along with some mangoes and a little strawberry nectar, it was a nice breakfast. We ate on the porch and Hannah read a little bit in the hammock while I napped. We visited the research center once more, this time to visit with Dr. Gyapong, the director of the center who supervised Hannah’s work in Ghana. She was so happy to see Hannah again and wanted to know all about our project. Hannah was beaming as she sat in her office and explained our film. After a quick lunch of red-red, stewed black-eyed peas with tomato sauce, fried plantains, and gari, or cassava powder, we were stuffed. I washed it down with an Alvaro – a malt soda to which I’ve become addicted. 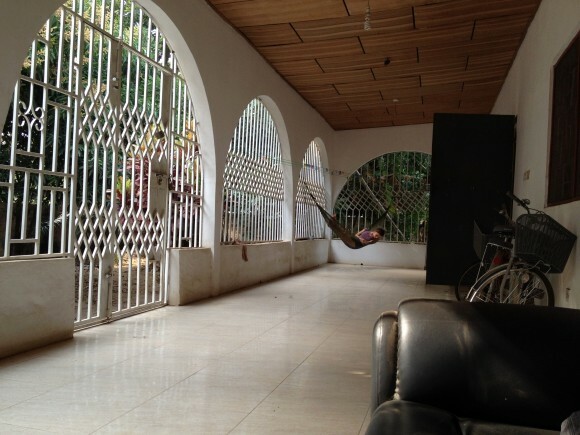 We swung by the guest house to pick up the hammock, which we set up outside of Charity’s house. When the kids arrived from school, they were in for a surprise. 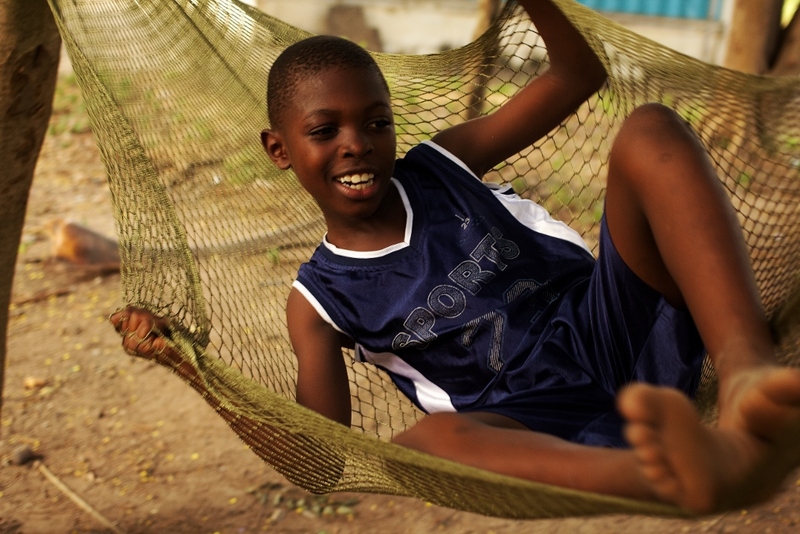 Hammocks are fairly rare in Ghana, something I had never considered, and the five dollar hammock I bought in Saigon fascinated the children. I set it up between two small trees (which creaked nervously with every swing)and the kids went wild. They begged to be next in the fishing-net contraption and they pushed each other as hard as they could. There were a few bumps and scrapes, like when two-year-old Kojo pushed with all of his might and forgot to let go, but the laughter outweighed a few moments of dusty tears. After everyone had begun taking turns playing on what was now effectively an enormous swing, the rest began hopping up on my shoulders and singing to the camera. Hannah took photo and video the whole time and came away with some brilliant shots. Gina and Elvis pushing Quaiku in the hammock. Me consoling Kojo after he took a spill. Oti and Najalie posing for a pic! After a dinner of fried yams, which Emma turned into an eating challenge between himself, Oti, and I, we said a sad goodbye to Lovelyn. While we’ll be back in Dodowa very soon, she’ll be off to school and we won’t likely see her before we leave. Elvis and Lovelyn, before saying goodbye and heading back to school. We headed to bed and prepared for our early-morning flight to Sunyani, where we were set to meet up with Jerry Barnes of CURE and begin our official filming schedule. It had been a long day and we slept soundly. We had a big week coming up. We arrived on Phú Quốc Island only expecting to spend two nights, but it took Zach and I the duration of lunch to decide to extend our stay. Since we no longer had Tung, we no longer had filming permits, it seems we had about a week to spend wherever we wanted in Vietnam. Of course, we weren’t finished working on some of the more mundane organizing of our physical and digital data. I highly doubt there are many more places in the world I would rather spend this time than Phú Quốc Island. Honestly, I felt like I was in a postcard. The water was clear, the sand soft, and the food so fresh. To top everything off, one evening we even found a woman with her small monkey out on the beach. Rose took us to yet another night-market for dinner. However, this one was very different than the one in Ho Chi Minh City. 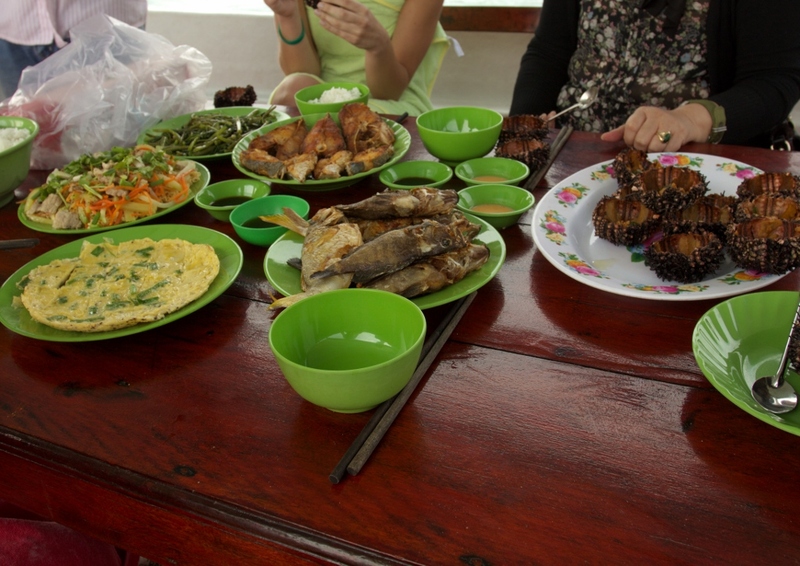 Instead of sitting down for a bowl of noodle soup, we picked from a variety of fresh seafood from a table, which was promptly grilled, and brought out on enormous platters. First, we had shrimp, each piece large enough to be a meal on its own (longer than my hand!). Zach was excited about a full (yet still small) sand shark, and when he found out that it was well within our budget, ordered the whole thing. The next morning, Zach and I went out on the beach, staking out some of the few lounge chairs not occupied by other (largely Russian) tourists. Yes, Russian tourists. I think Jana, Zach, and I were some of the few Americans on the island. There were clearly more visitors from Western Europe, but by far Eastern Europe was best represented. I have to admit it was a bit odd. For those of you familiar with my past travel, I felt like I was back in Moldova – if Moldova had been transplanted in Asia. It wasn’t rare for us to see signs and menus on the island available inVietnamese, English, and Russian. We even ate at a Russian Restaurant one night for fun later during our stay. I didn’t know Vietnam was such a destination for Russian snow birds! New Years Eve was our last full day with Rose. We started off the morning by interviewing her on her experience with clubfoot here in Vietnam and POF. We asked her about her role, and how she feels knowing that her work is making it possible for hundreds, if not thousands, of children to get treatment that literally restores their ability to walk. She told us, humbly, that it fills her with emotion. She feels so much joy seeing and knowing that this work is affecting these patients’ lives, and feels sadness for those who do not receive the treatment they need. It is evident that Rose and the Vietnam Clubfoot Program are synonymous. I am honored that such an incredibly passionate and caring woman took us under her wing and gave us incredible access to the work that is being done here. Zach, Jana, and I wanted to do something nice for Rose, to thank her for putting so much effort into making our time in Vietnam smooth, easy, incredibly informative, and ultimately successful. 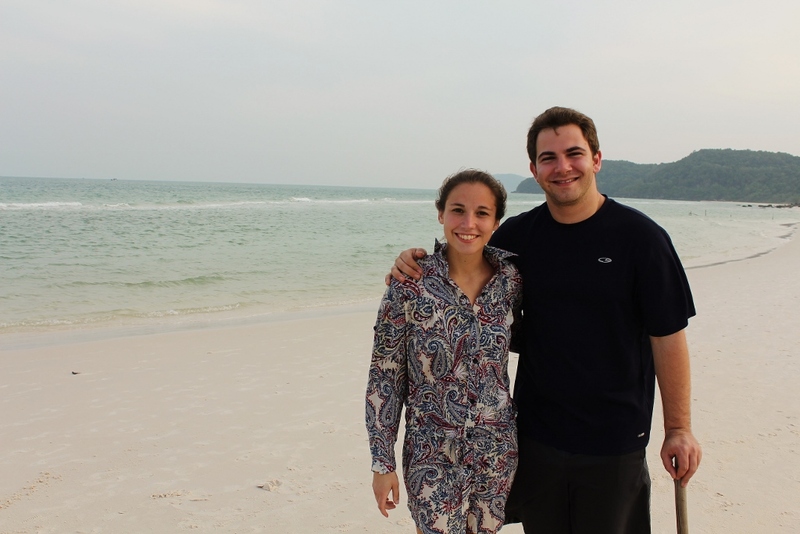 We hired a boat (outside of our project budget, of course), and spent the rest of New Years Eve (day) with Rose exploring smaller islands around Phú Quốc. After a few minutes of riding around, the captain stopped the boat, and our guide, Dong, showed us how to fish with a large spool of line, a hook, and nothing else. Zach was able to catch quite a few small grouper, while I was quite unsuccessful, catching nothing but my own line. The boat engine reared up, and we headed to a secluded rocky beach. Zach, Jana, and I put on snorkel gear and explored the clear waters, looking at all of the beautiful tropical fish and plants. Zach continued to try to lure them in with some bait in hopes of catching even more. They were too smart for him, gobbling up the tiny piece of squid before he could pull in his line (though he did catch one after diving into the ocean, line in hand). After our short swim, it was lunch time. Rose surprised us by ordering some delicious sea urchin from a nearby vendor boat. Dong served the fish we caught along with a variety of other grilled seafood. We enjoyed the food with myrtle wine (after Zach tasted sea-horse wine and was unimpressed). After resting for the remainder of the afternoon, we headed back to shore. On our way back to the hotel, Dong took us to another beach with white sand and turquoise water. It was beautiful, so Zach and I took some pictures, but the large amount of tourists was a deterrent, and we didn’t stay too long. 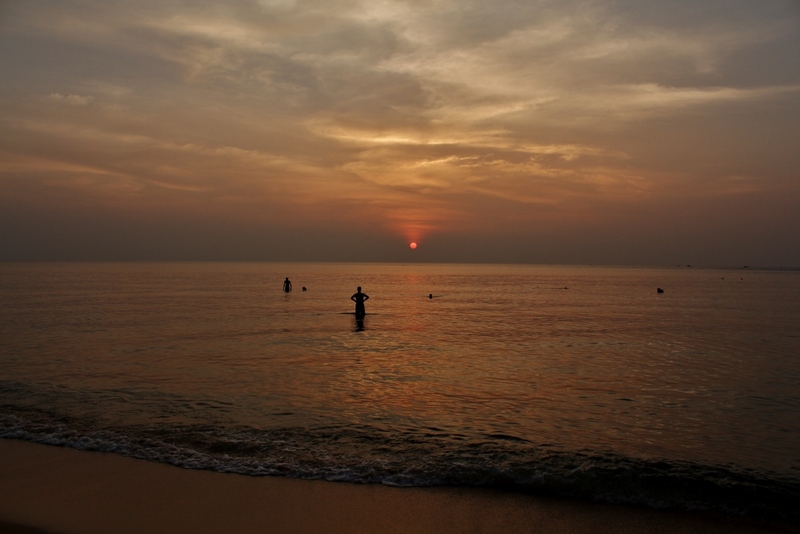 We arrived back at the hotel in the early evening, showered, and headed down to the beach for dinner. The hotel was putting on a New Years Eve party for all of the guests, staff, and their families. A massive amount of fresh seafood was grilled, and we watched as a bonfire of coconut trees and bamboo was set around 11 p.m. Finally, we knew we had officially made it to 2014 when a couple of giant sparklers were lit, and everyone yelled Happy New Year in their respective languages. However, our New Year was suddenly filled with sadness when we had to say “Tạm Biệt” (“goodbye” in Vietnamese) to Rose. She hadn’t seen her own family in quite some time, and didn’t extend the trip with the rest of us. She was leaving on an early flight the next morning. She told us that we must let her know when we come back to Vietnam, to which we responded “How could we not?! You were the best tour guide we could ever have. You spoiled us completely!” We gave her hugs, and then more hugs, and watched each other head to our respective rooms. Zach and I had grown quite close to her over the course of the past month, often times calling her “Mama Rose,” which made her grin. 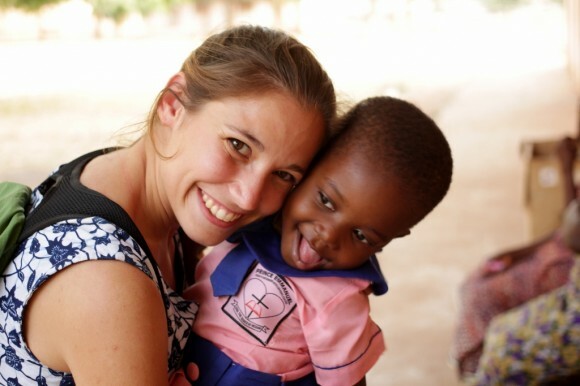 Although it was very sad to see her go, we feel so lucky to have gotten to know her and experience her altruism – an unforgettable quality which I hope to emulate in my own life. We spent the rest of our time in Phú Quốc organizing, catching up on some much needed sleep, stocking up on Vitamin D (sun) and Vitamin C (fruit), and most importantly, processing our time in Vietnam. We talked about common observations and debated conflicting ones. Although we’ve mostly focused on clubfoot (and food) in these blogs, we’ve experienced and learned so much about Vietnamese history, culture, politics, and the national economy – all of which ultimately impact a patient’s ability to receive effective clubfoot treatment. In my courses at Georgetown, we called these factors “Social Determinants of Health,” but for the rest of the world, these factors are called “life.” Our documentary would be incomplete if we failed to understand the more complex parts of life in Vietnam – and our time here has given us a chance to really dive into these issues, come away with great footage, and consider the larger picture. 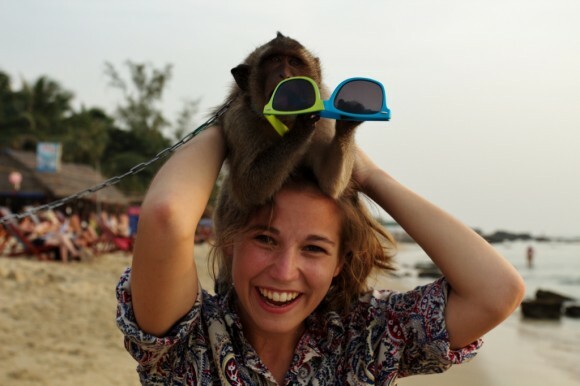 After saying a final goodbye to our travel partner from POF, Jana, we parted our separate ways. She was heading back to Hanoi to finish up some work, while we headed back to Saigon for a short stint before leaving the country. We’d grown very close to Jana over the course of the last month. We were also sad to see her go, but I think she was just as confident as us that our paths would cross again in the future. We are so appreciative to her and POF for organizing such an enlightening adventure across the country. 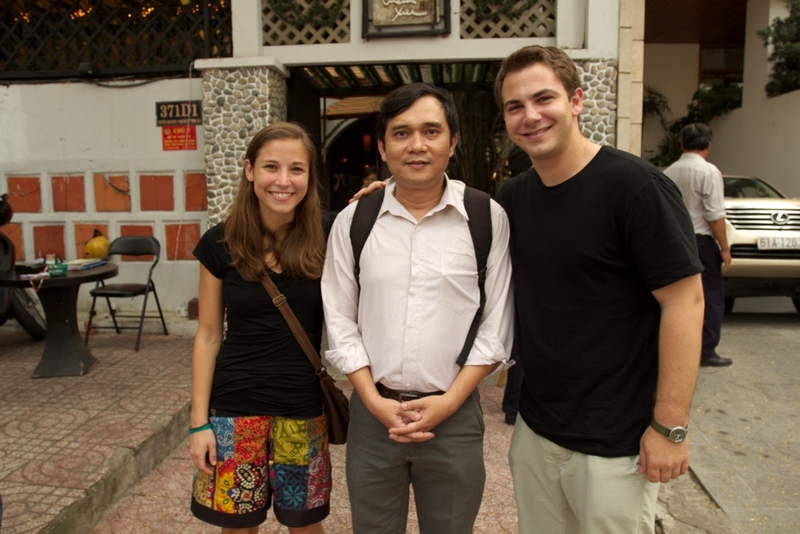 During our last day in Vietnam, we decided to meet up with Dr. Nhi for lunch. We thought we’d give him a Footnote Film t-shirt, and thank him for the work he has been doing. However, we didn’t expect the surprise he had for us, which would ultimately tie up our month in Vietnam. In our last post, we described a girl, about 6 years old, who had neglected clubfoot. Zach accurately portrayed the extent to which Dr. Nhi went to reach out to the girl’s family, in hopes she would come back to the office to get treated. At lunch, Dr. Nhi brought up the blog, which had just been posted the night before. He said that, after reading the post, he was inspired to call the family just one more time. It had been quite a while since Dr. Nhi had tried to call the patient, and each time, the family never answered. However, on that day, they answered. Dr. Nhi was finally able to talk to the parents and convince them to come back to the hospital so that he could evaluate their daughter for treatment. Although they were planning on starting treatment in the summer, since the girl is now school-age, they agreed to meet with Dr. Nhi. Zach and I were instantly relieved. It seemed too coincidental to be true, but in fact it was. The one untreated patient in Vietnam we remotely encountered was now on her way to be treated. She will, hopefully, live a life of normalcy, not bound by the constraints by the very part of the body meant to take you places. We felt a sense of completion and peace as we boarded the plane last Monday night. We could leave Vietnam free of unfinished business.